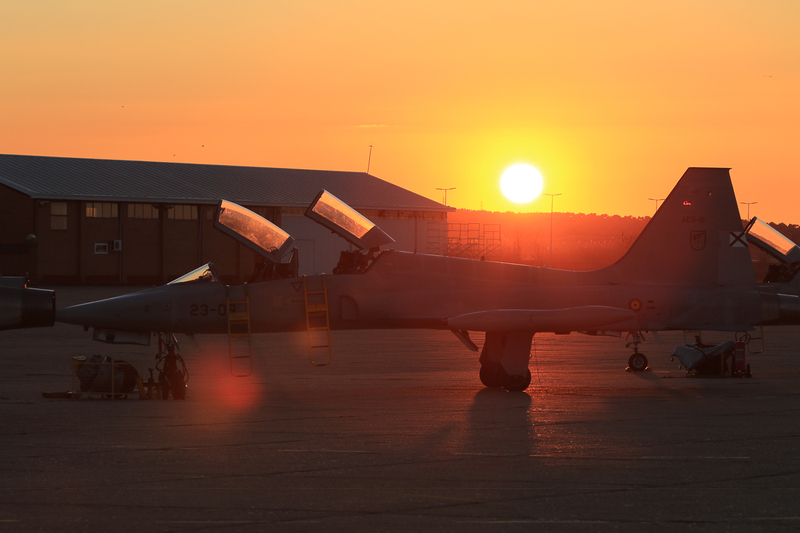 Imagine a region where it rains on average slightly more than a month out of a year: perhaps it’s not good for agriculture but it’s a wonderful place where to teach pilots to fly! 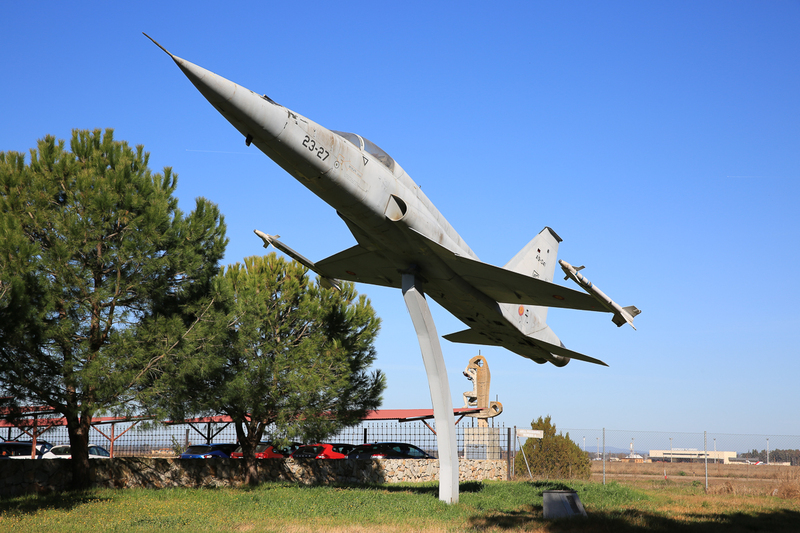 In Spain a region like this is Extremadura, located in the southwest of the country, bordering with Portugal. 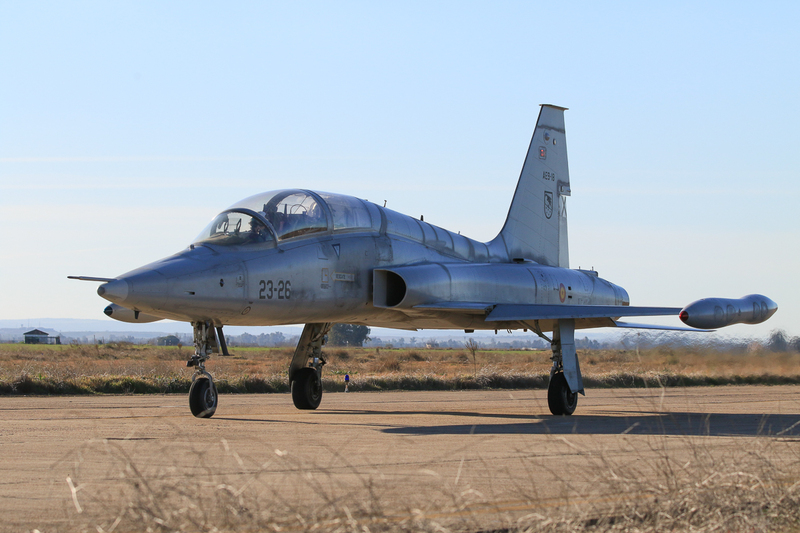 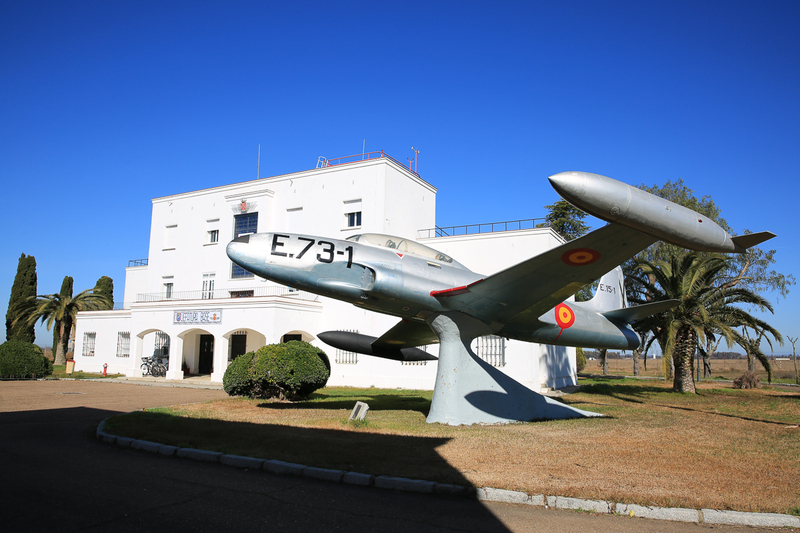 Since 1954 Talavera de la Real hosts such a school, established as Escuela de Reactores (Jet School), then renamed Ala 23 de Instrucción de Caza y Ataque (23rd Fighter and Attach Training Wing) in 1987. 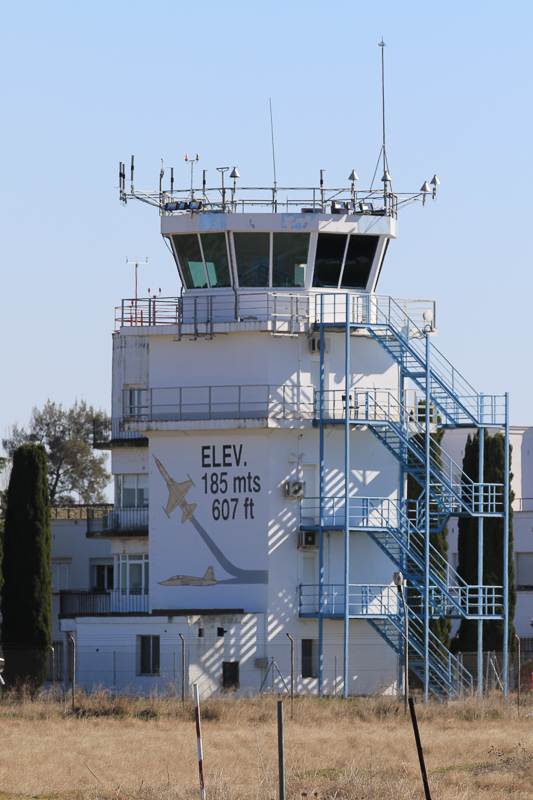 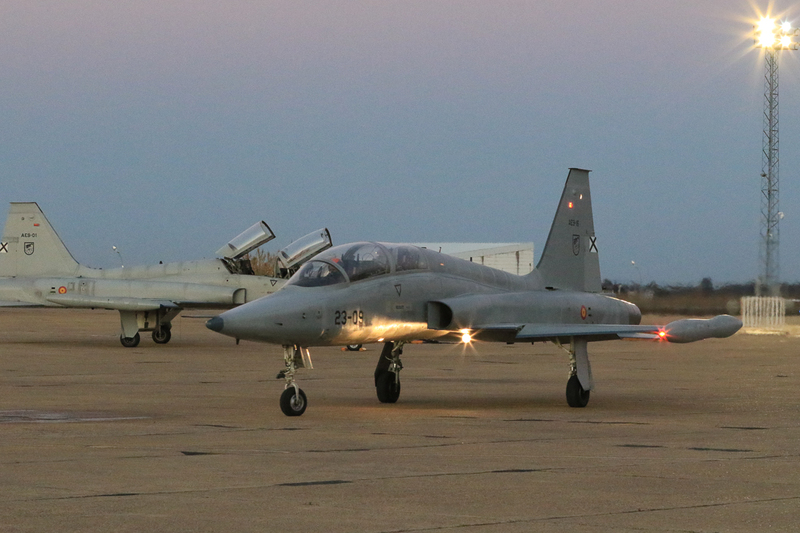 Ala 23 shares the runway with the civilian airport of Badajoz, but the few domestic flights create little interference with the military activities. 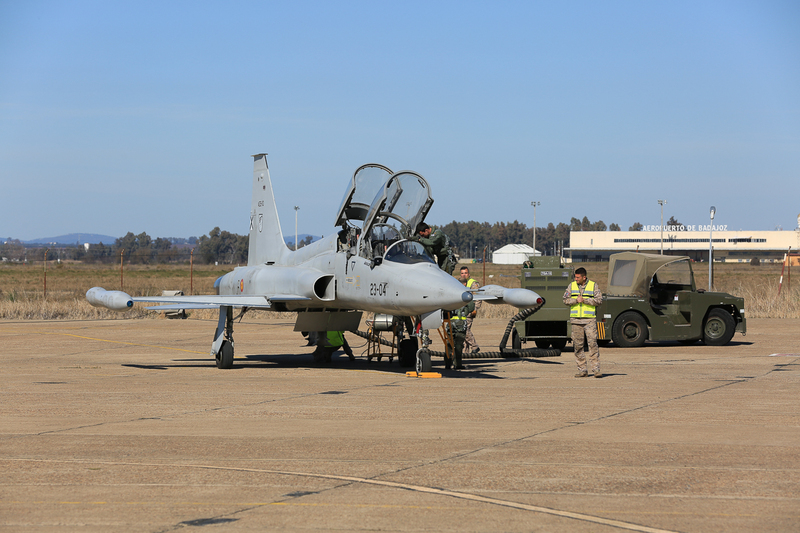 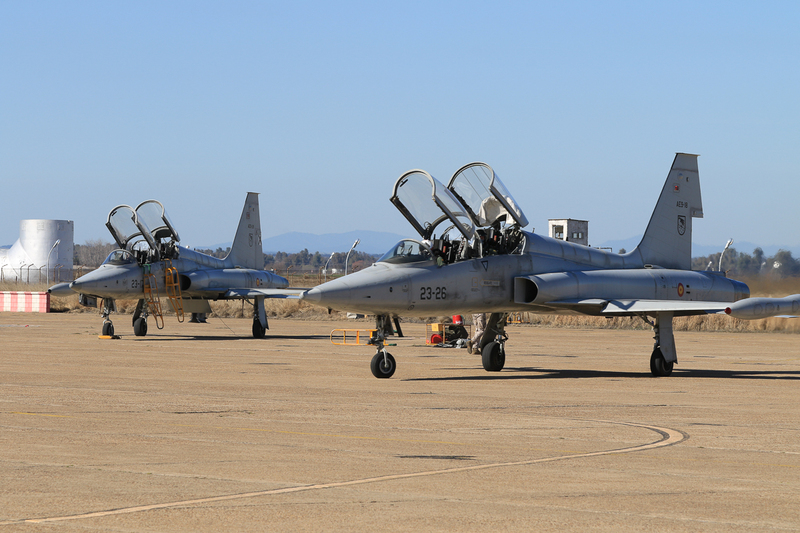 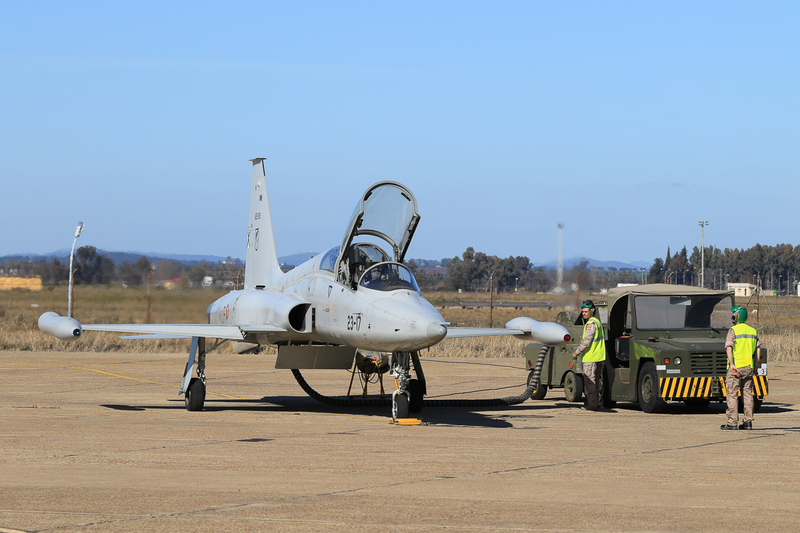 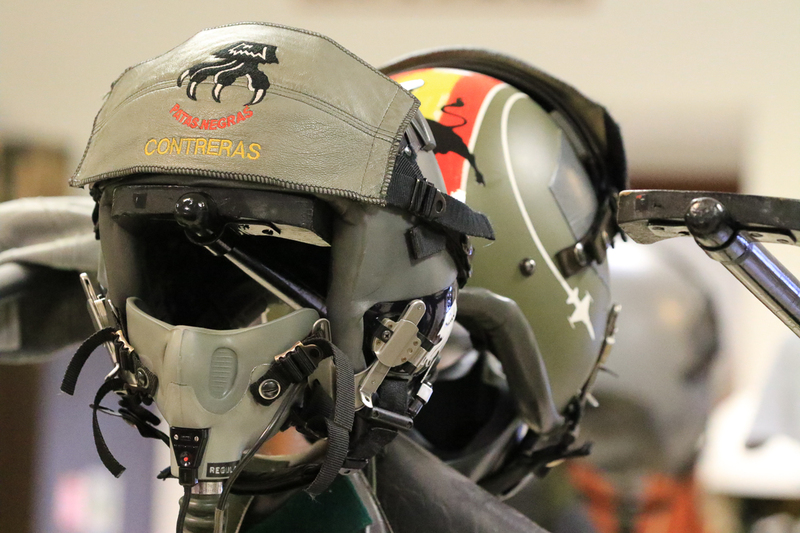 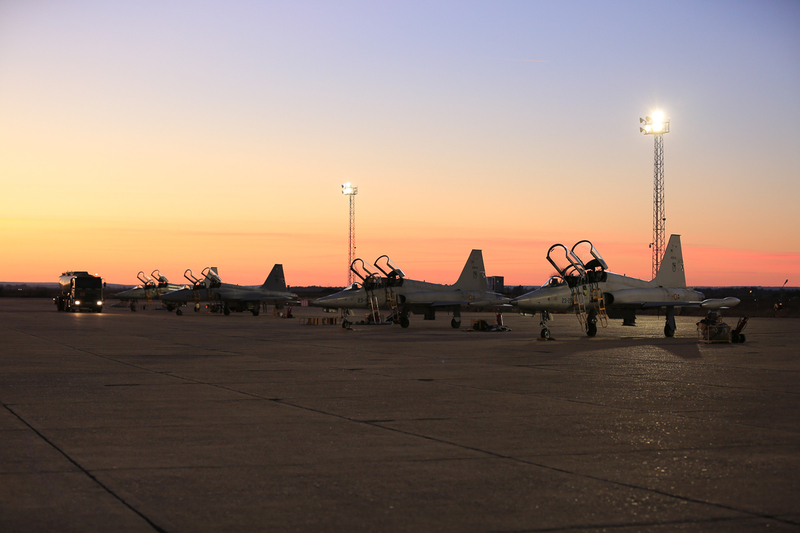 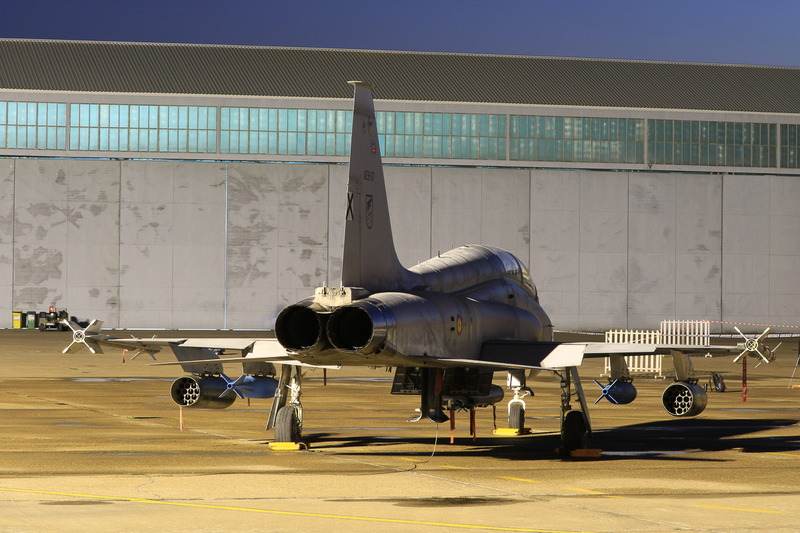 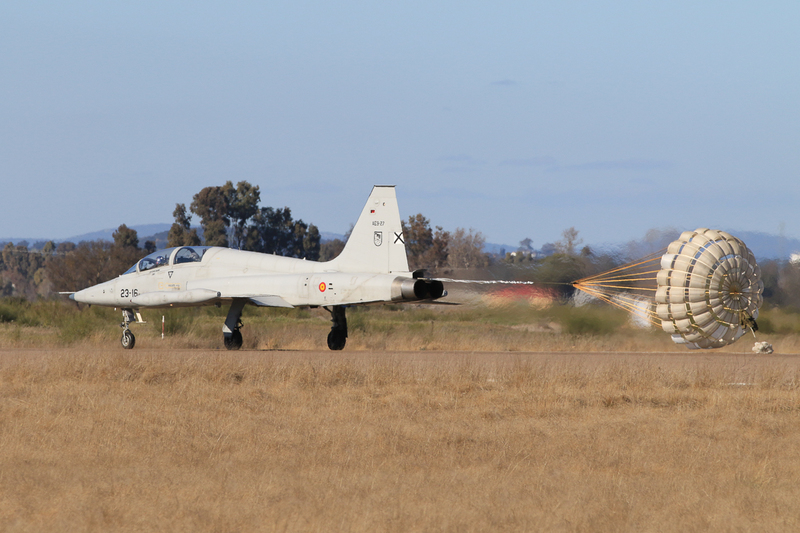 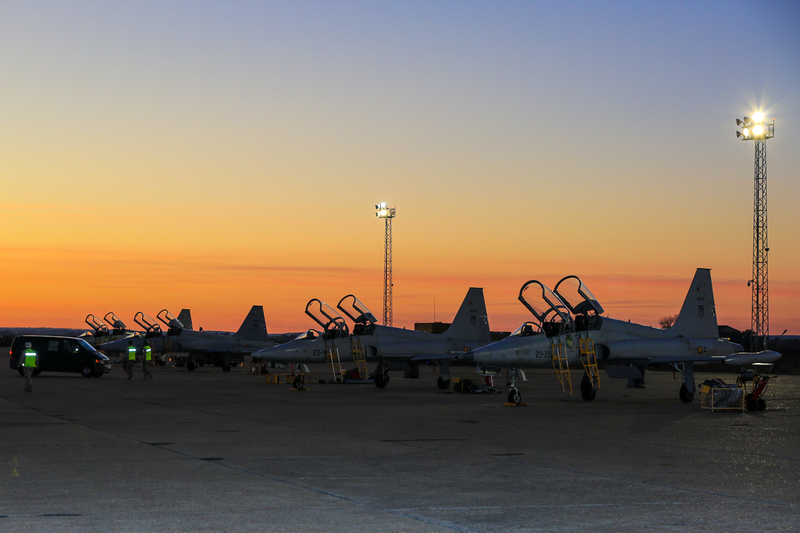 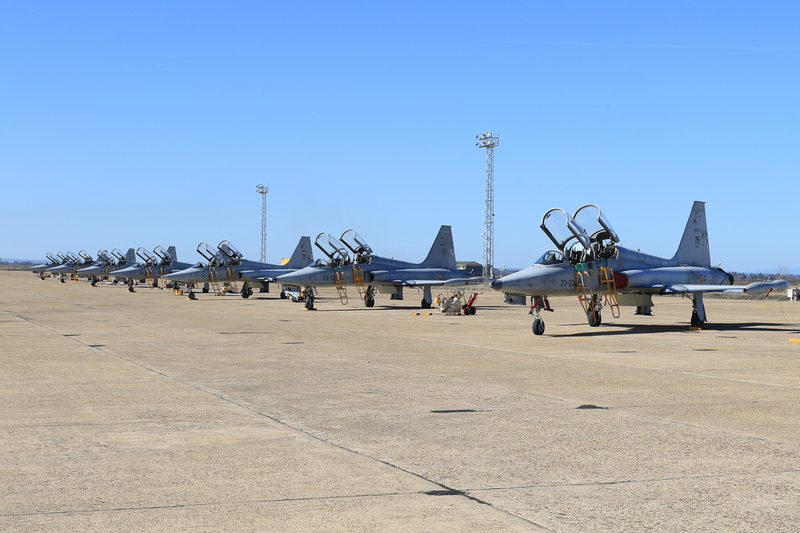 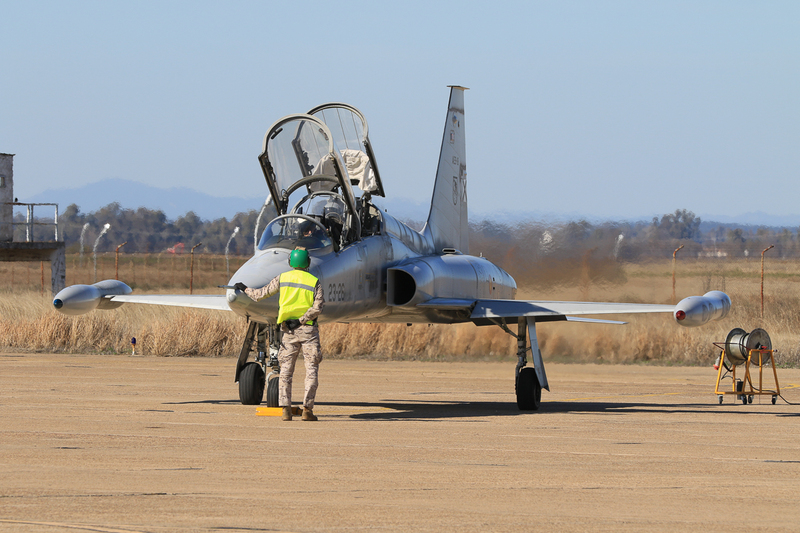 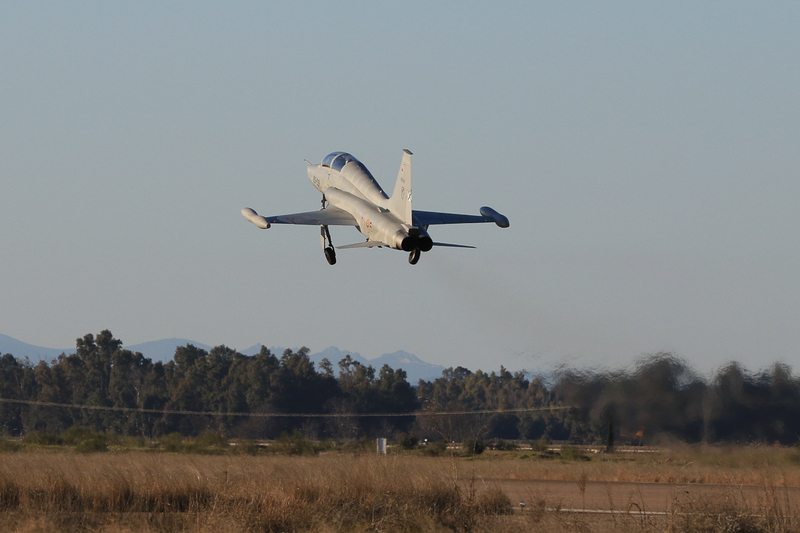 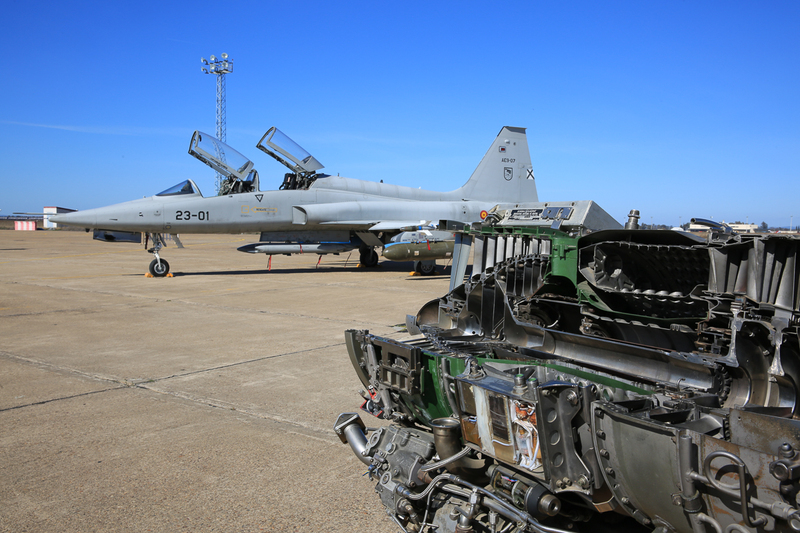 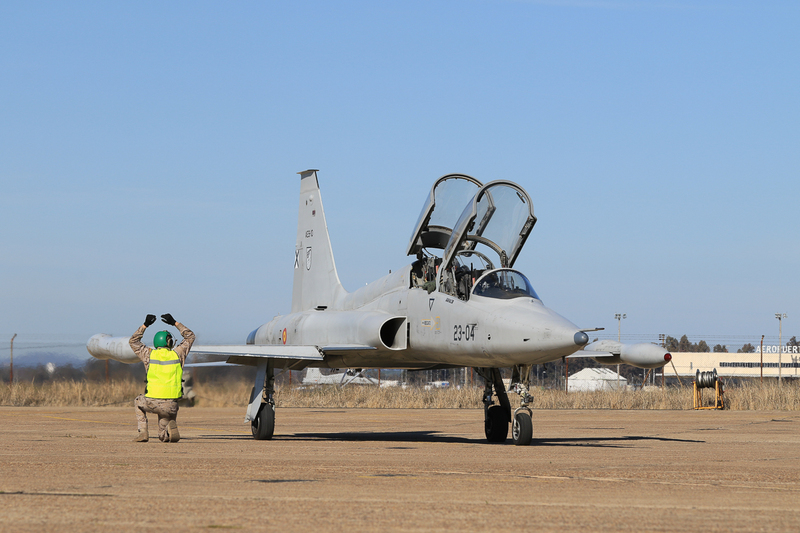 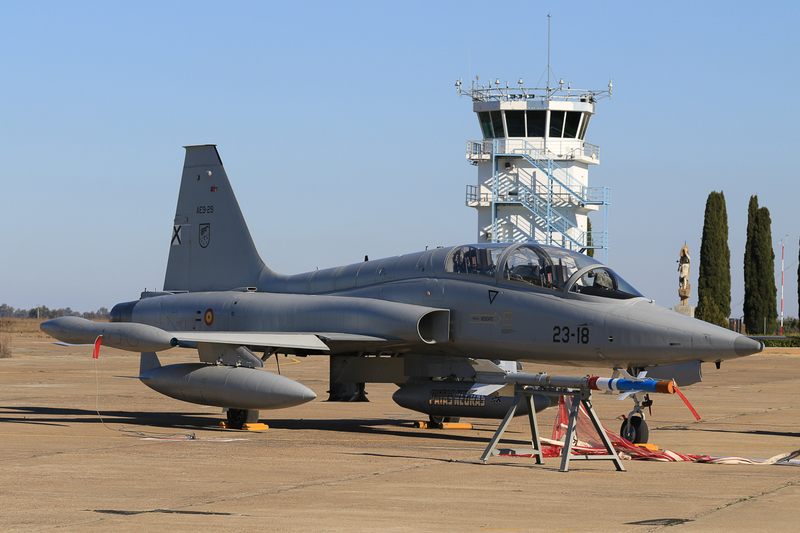 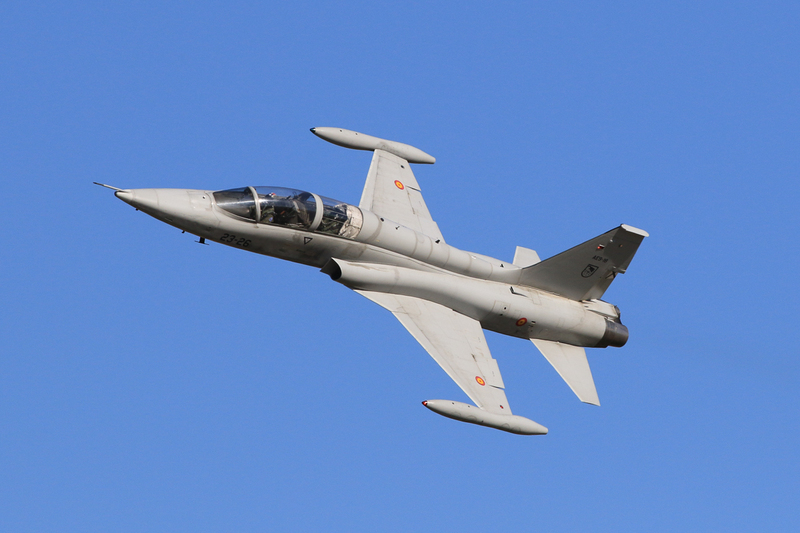 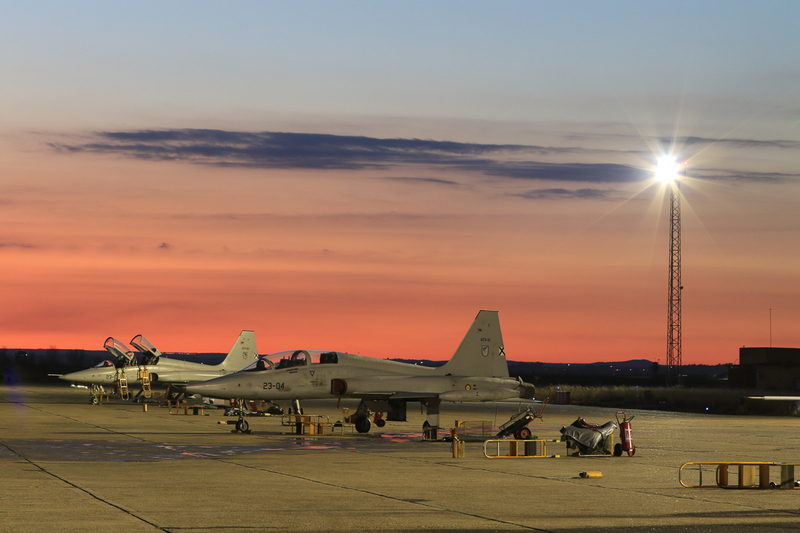 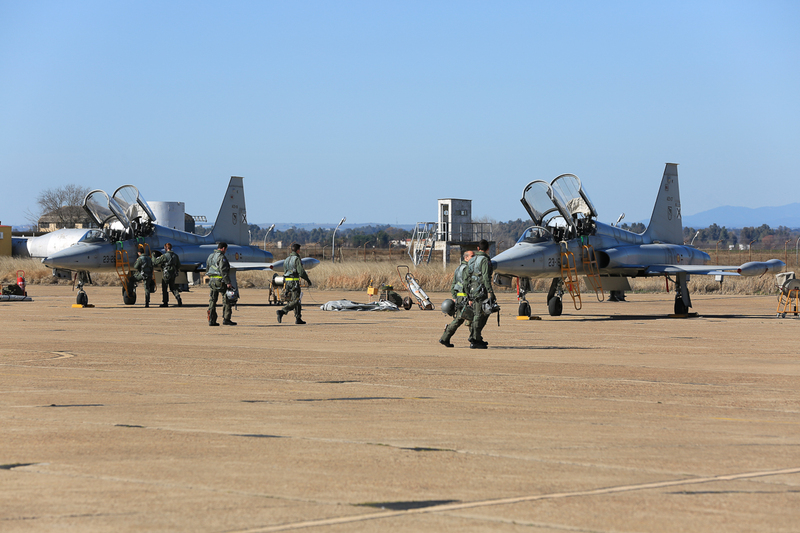 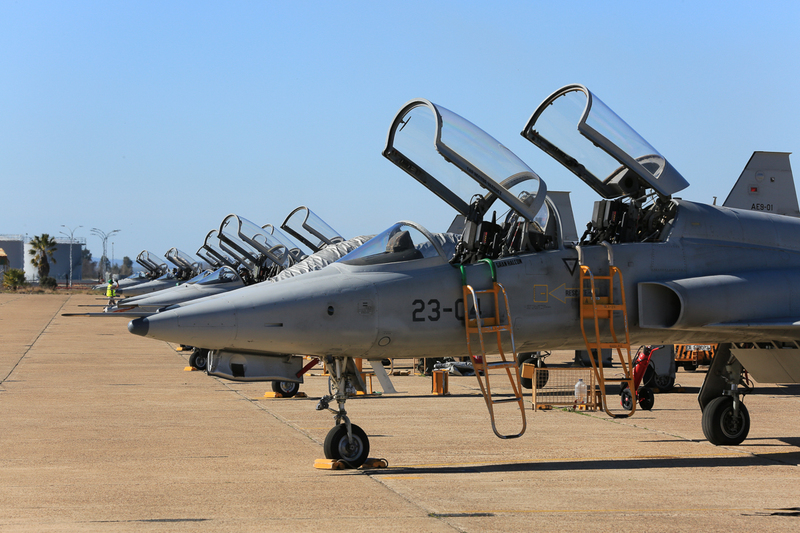 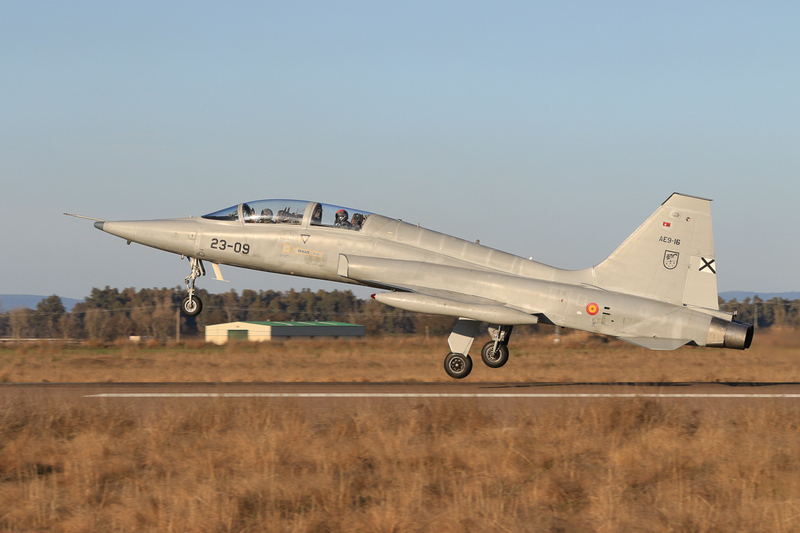 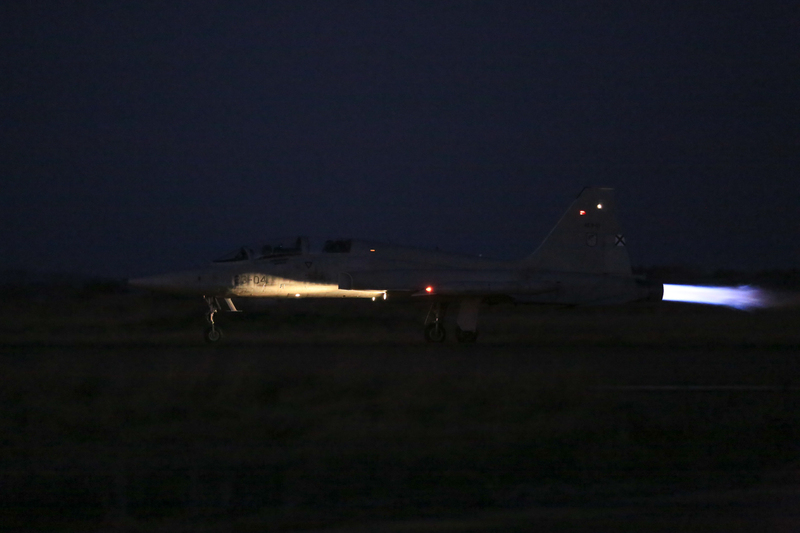 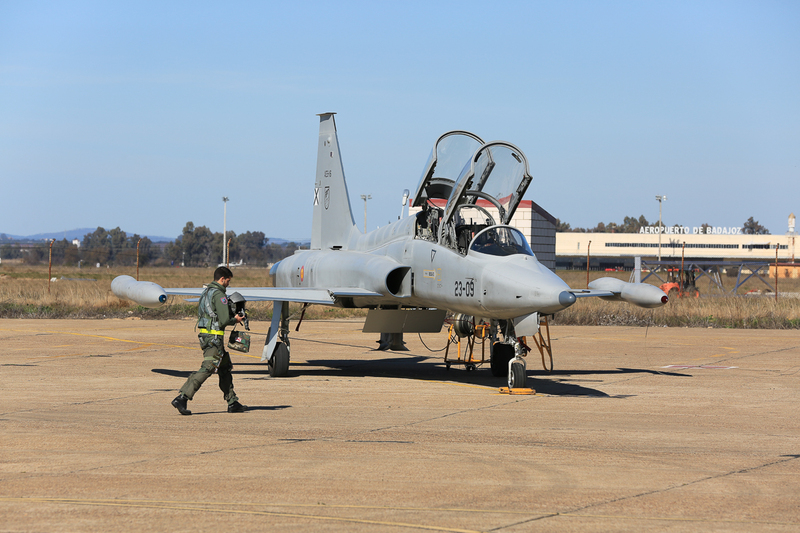 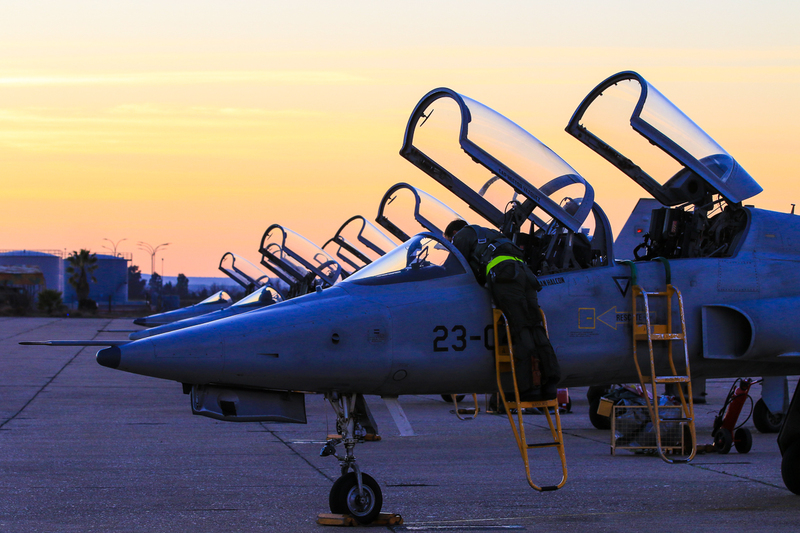 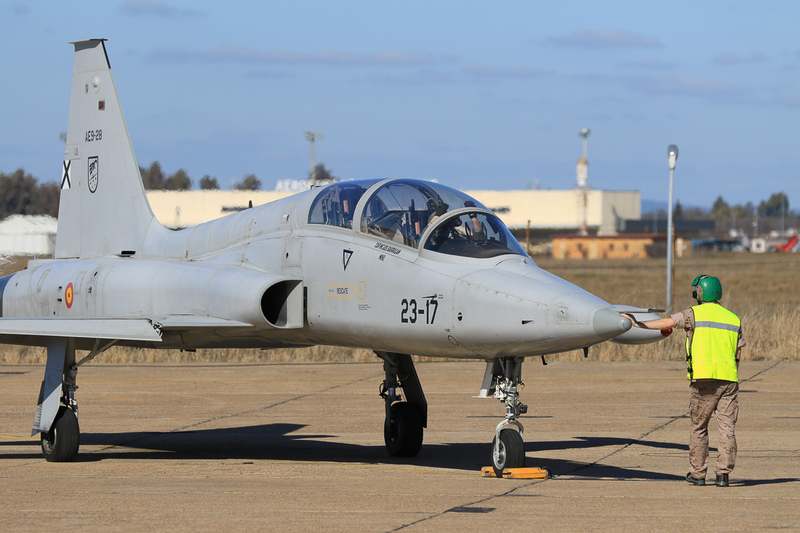 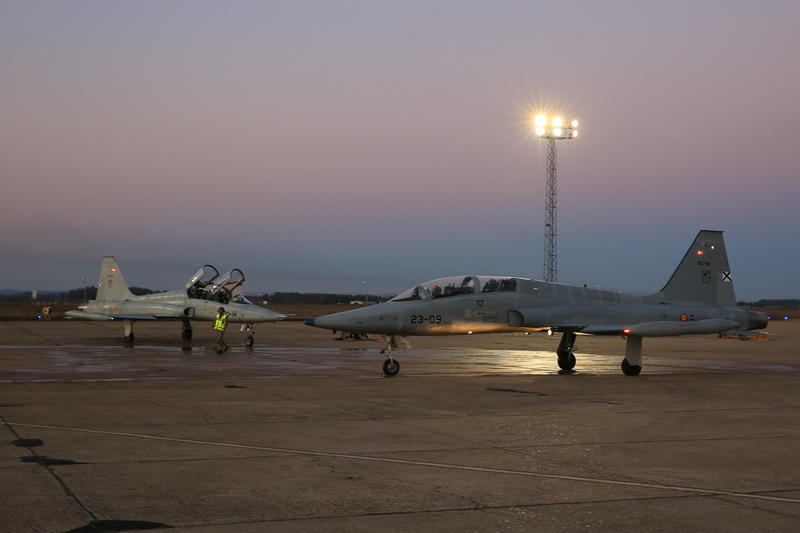 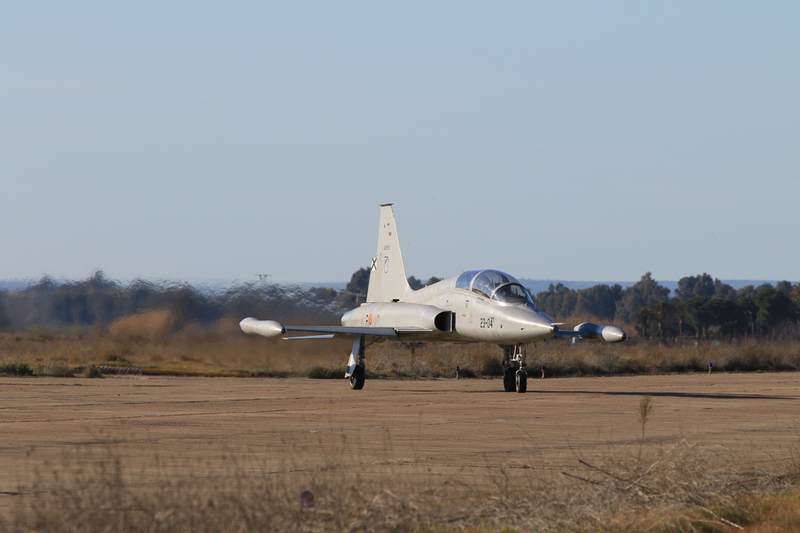 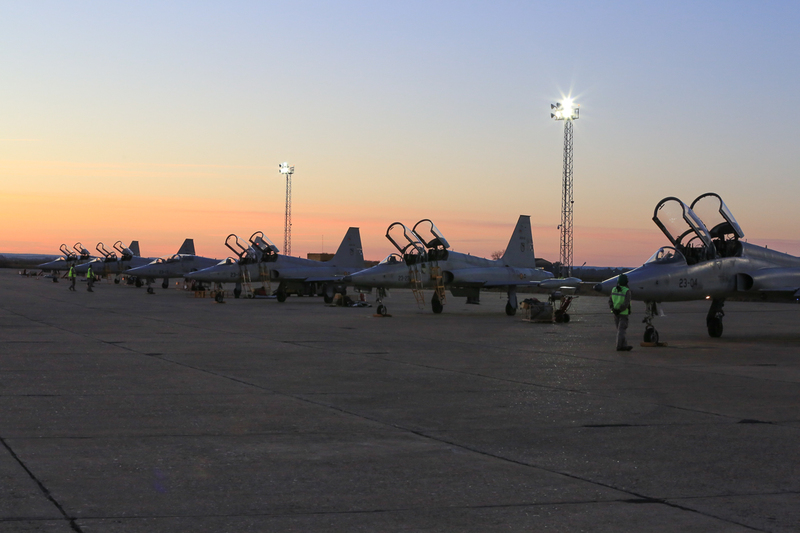 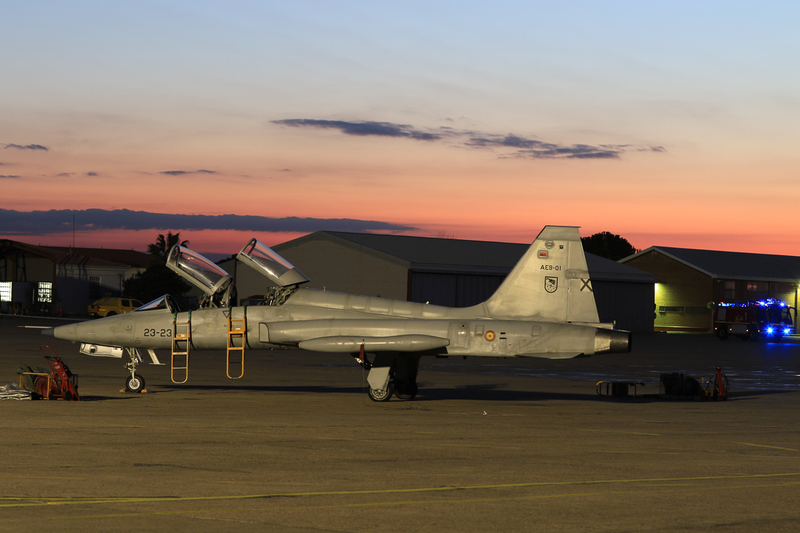 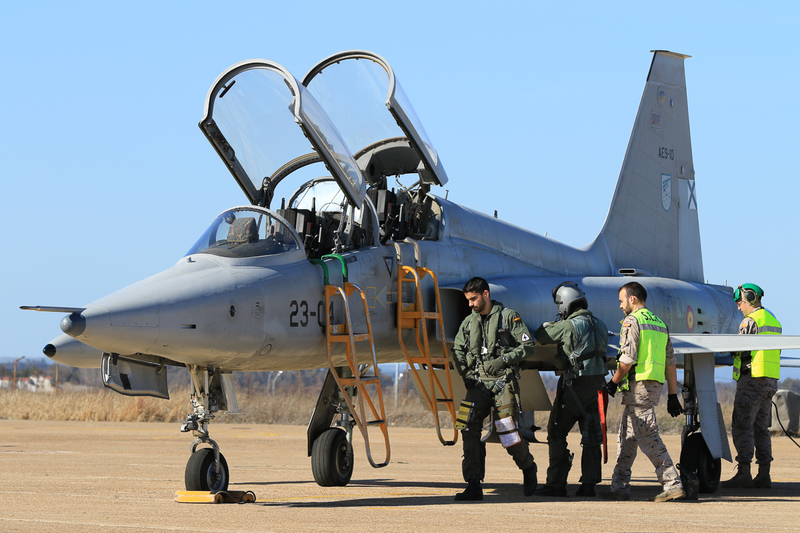 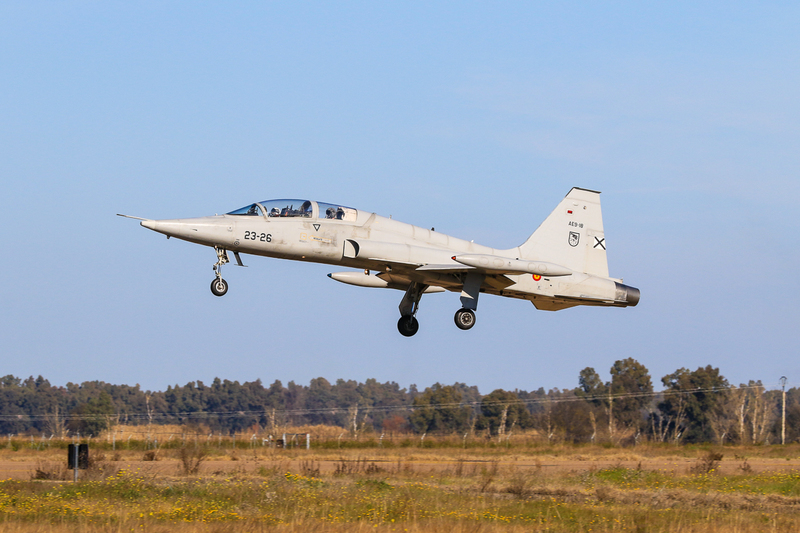 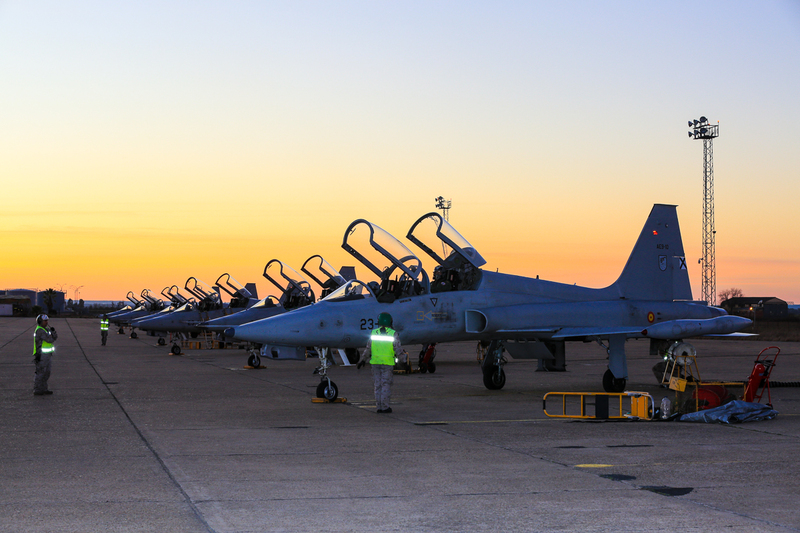 In Talavera the Ejercito de l’Aire (Spanish Air Force) trains the students who have completed the 4th class of the Academia General del Aire (Air Force Academy); this is the final step for those young pilots that, once successfully graduated, will fly on the EF-18 Hornet or the EF-2000 Typhoon. 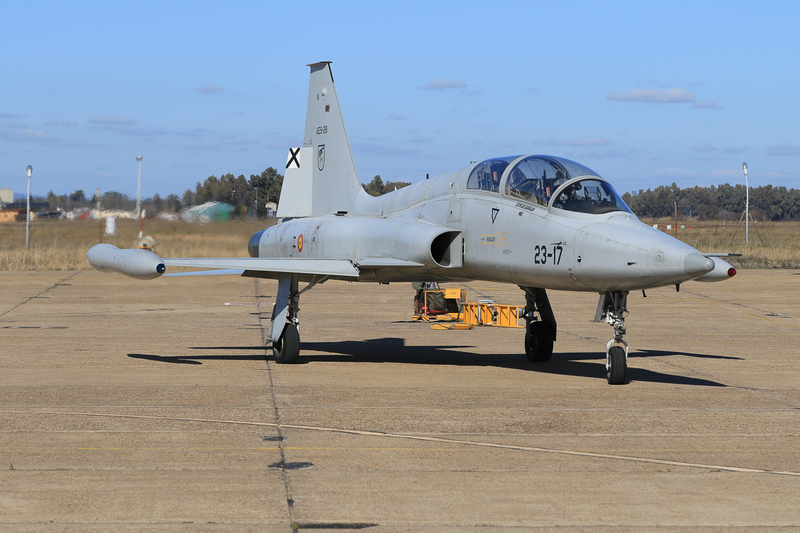 Cadets selected for Talavera have already flown around 48 hours on the ENAER E-26 Tamiz, a Chilean propeller-driven basic trainer derived from the Piper PA-32R, and at least 110 hours on the CASA C-101, the Spanish advanced trainer also flown by the national aerobatics team, the Patrulla Aguila. 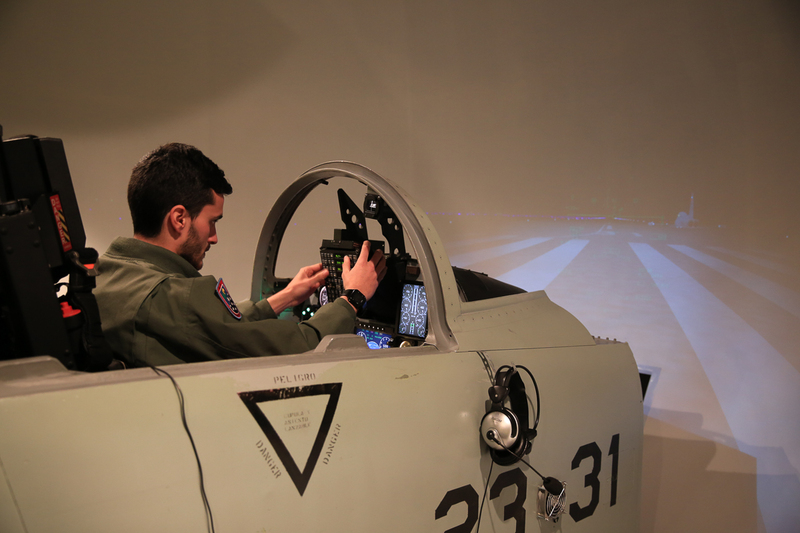 The Fighter Pilot training course usually starts in September and lasts till the next year in May; after having completed the flying course the students go back to the Academia to complete their academic studies and then graduate in July. 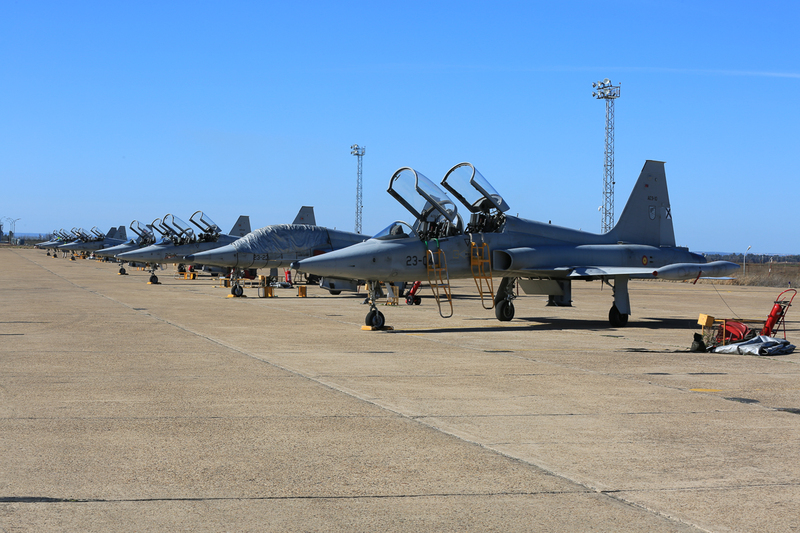 Each year about a dozen of students are assigned to the 232 Escuadrón, one out of the two forming the Ala 23. 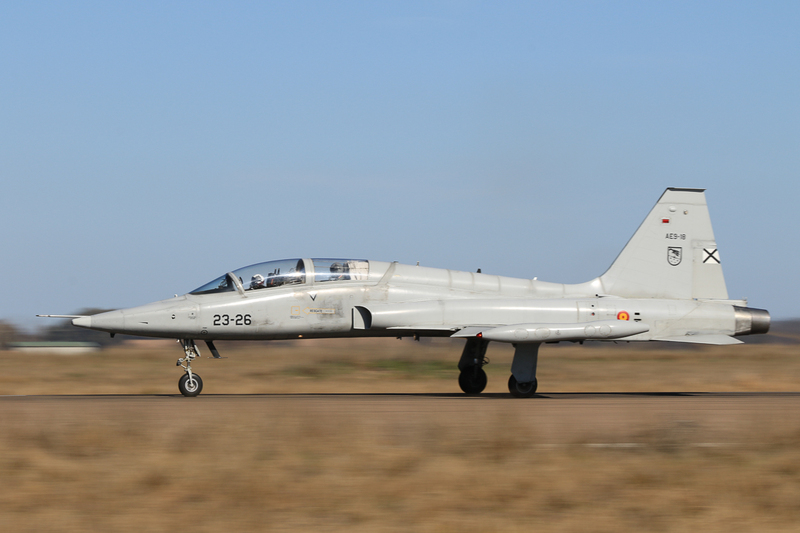 The other one, the 231 Escuadrón, is composed of the instructor pilots; 16 on average, their assignment lasts usually two years. 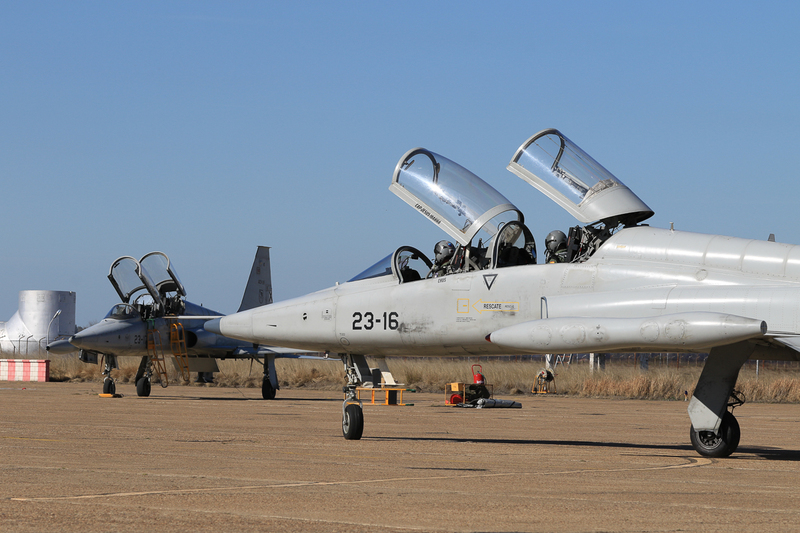 After the graduation of the students, some of them can be tasked to become FAIP (First Assignment Instructor Pilot); obviously, not having previous experience as fighter pilots, their training course is longer than the normal syllabus. 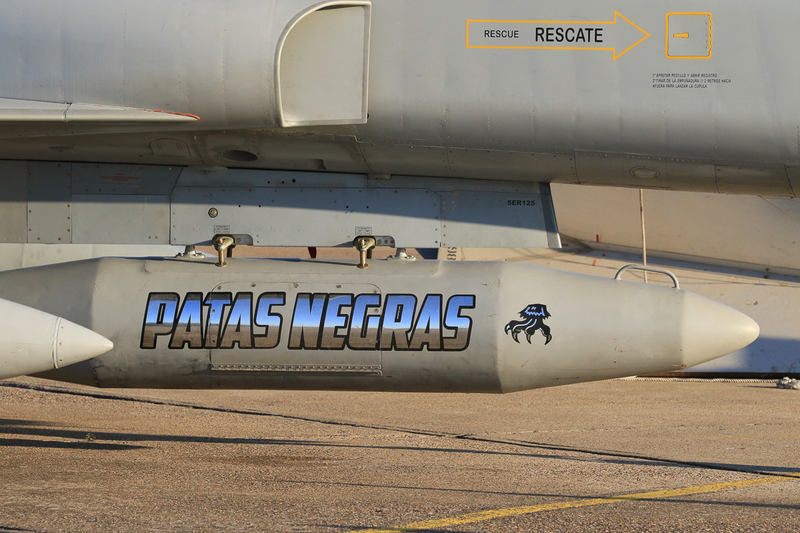 Both Squadrons’ badges represent the same image, which refers to the nickname used for the instructor pilots, “Los Patas Negras” (Black Legs); it’s a symbol of excellence, because Extremadura is home to a pure-bred Iberian pig, which has black nails, from which is produced a world-renowned cured ham. 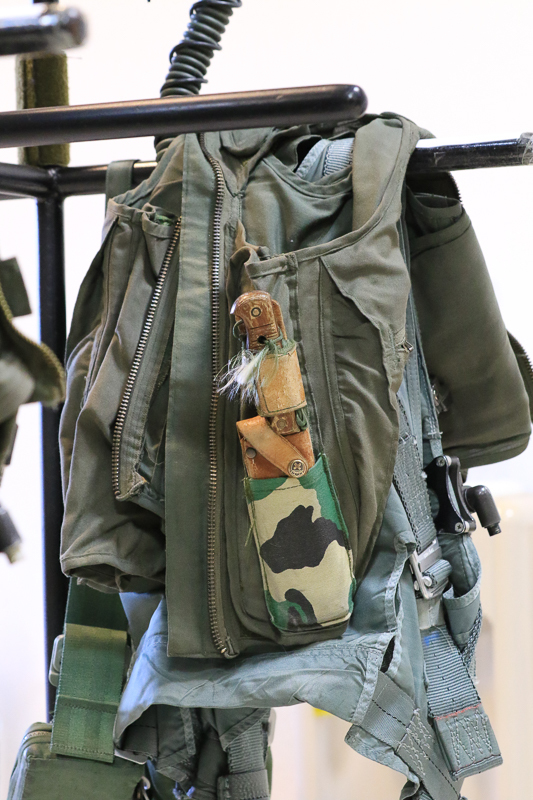 The nickname seems also to have to do with the black flying boots wore by the students. 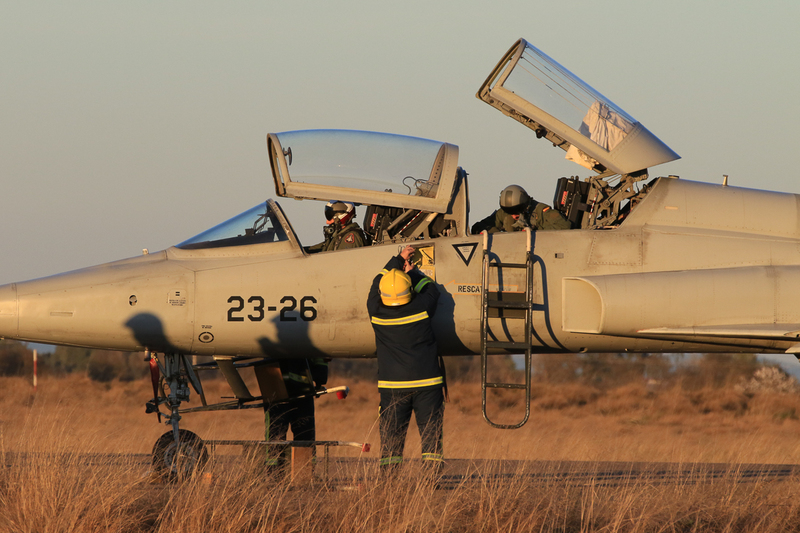 Thanks to a cooperation agreement between Spain and Argentina dating back to the ‘90s, it’s common to find Argentinian pilots among the instructors. 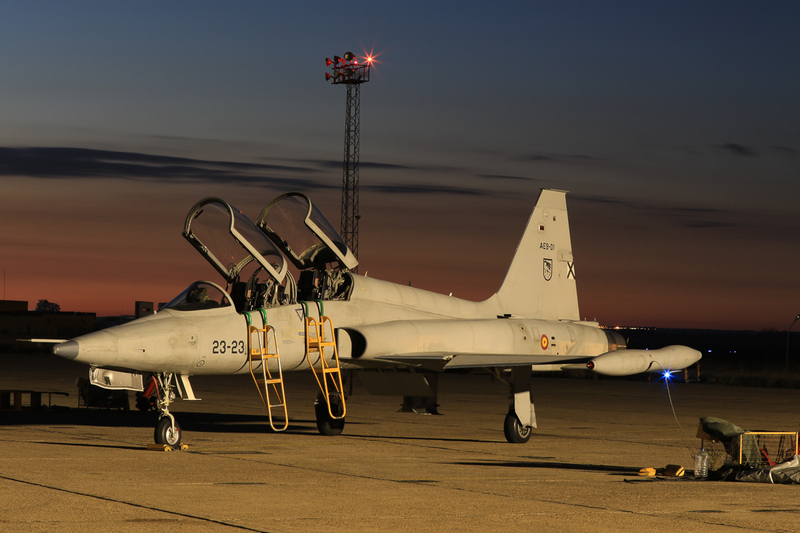 Usually two of them spend two years in Talavera, posting well appreciated because in Spain they have the opportunity to fly air to air and air to ground missions. 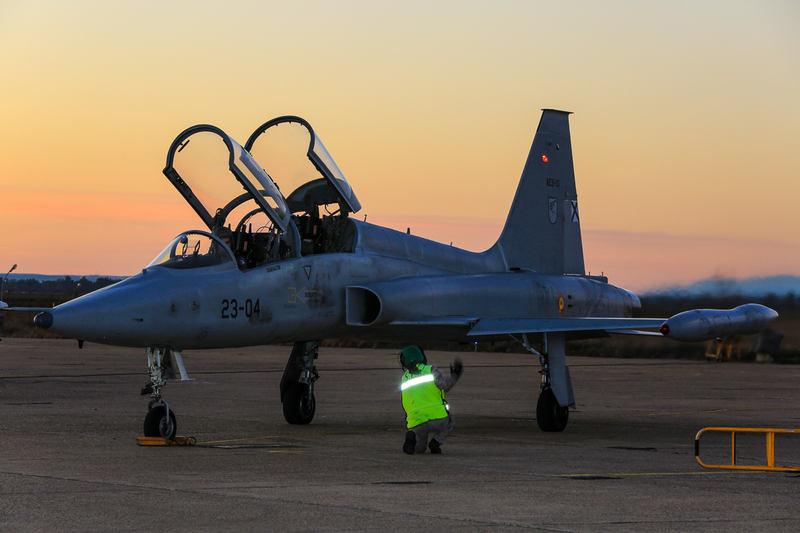 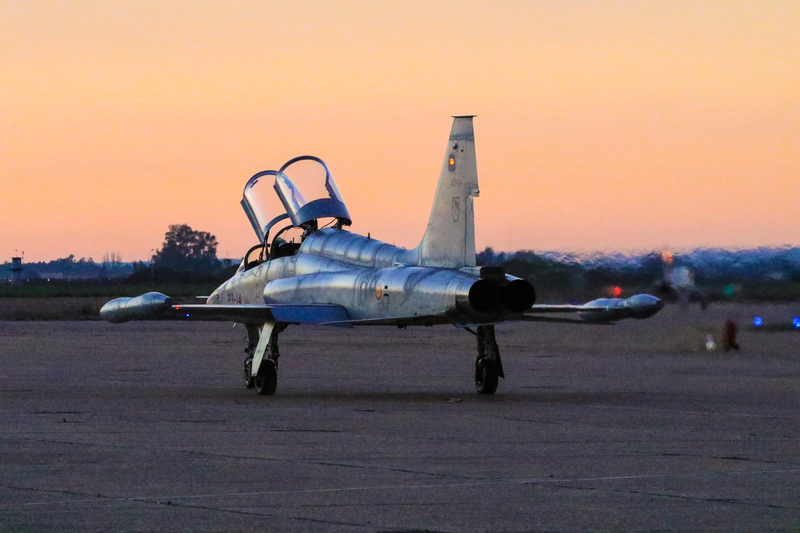 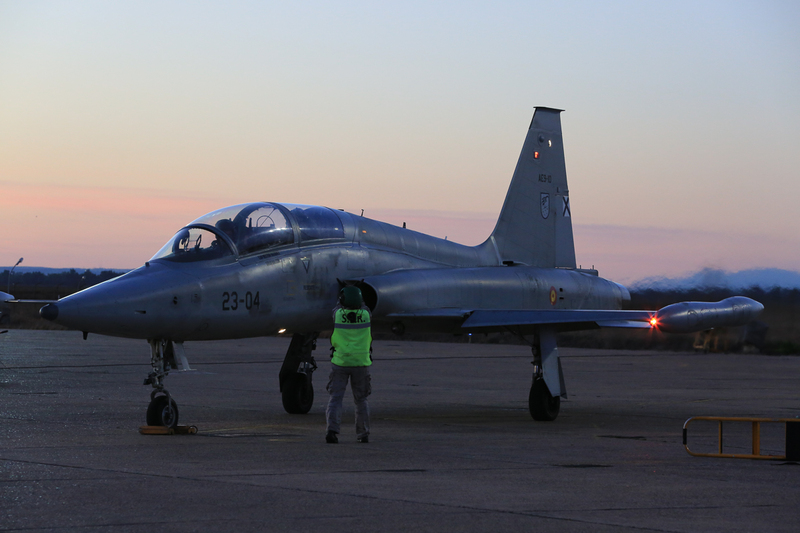 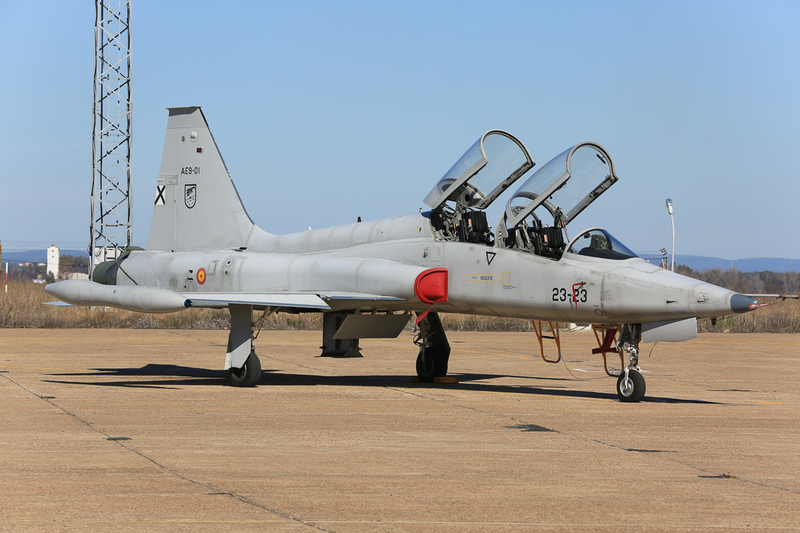 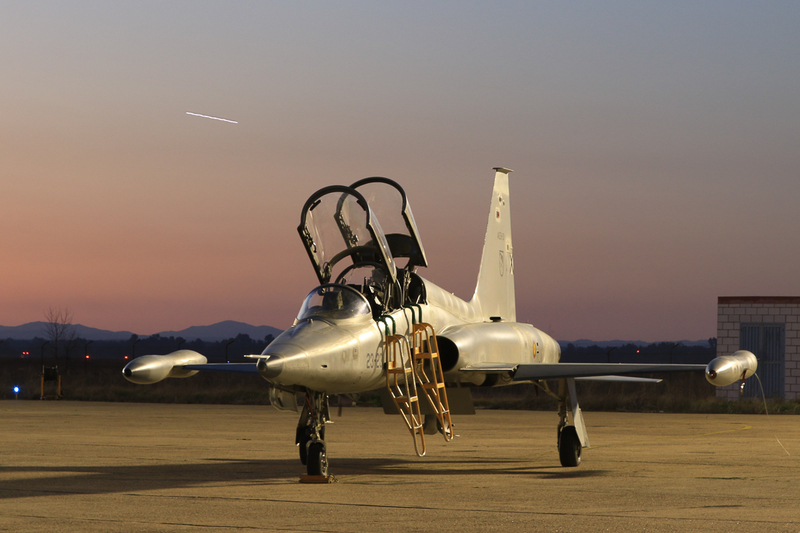 The aircraft flown by Ala 23’s pilots is the iconic Northrop F-5 Freedom Fighter; they are actually a version licence-built in Spain by CASA by virtue of a contract signed in 1966. 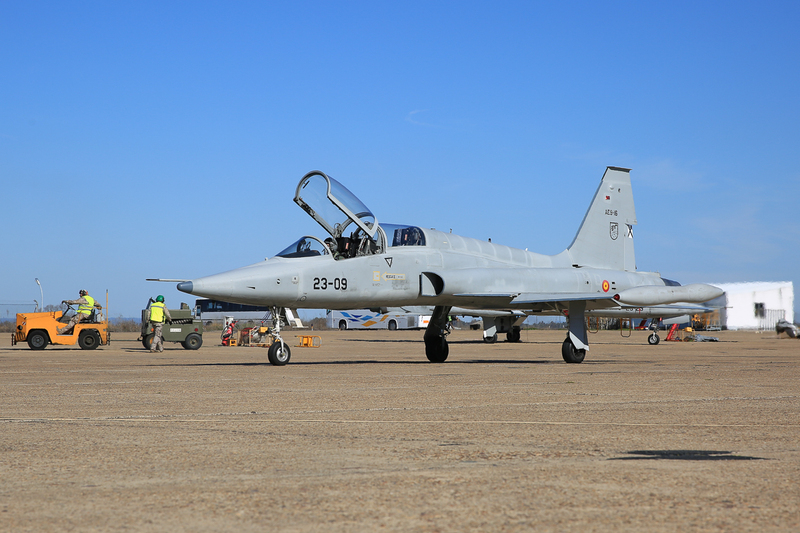 The Northrop airplane, selected to replace the North American F-86F in service with the Ejercito de l’Aire, was built in 70 units in CASA’s plant in Getafe, near Madrid, and designed SF-5A (fighter), SRF-5A (reconnaissance) and SF-5B (two-seat trainer). 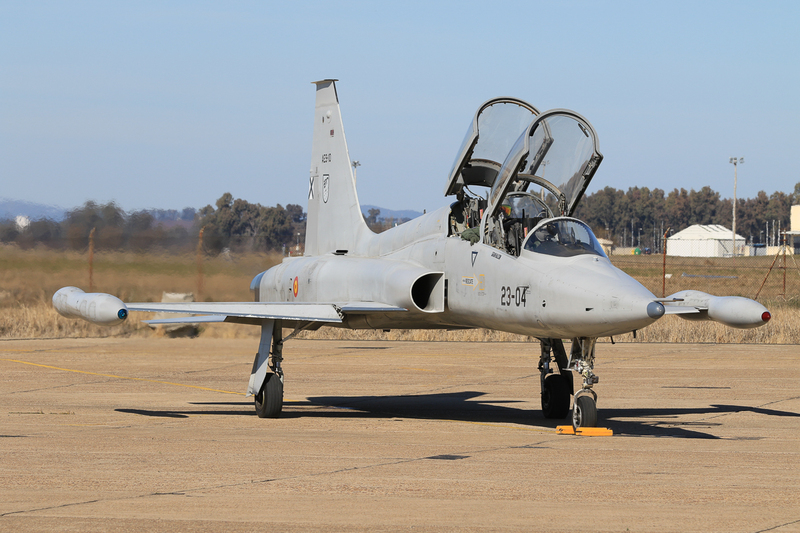 First three SF-5Bs landed in Talavera on November 1970 and in a few months 25 more followed to replace the Lockheed T-33A and the North American F-86F used for the advanced training, which had totalled respectively 79,000 and 27,000 flight hours. 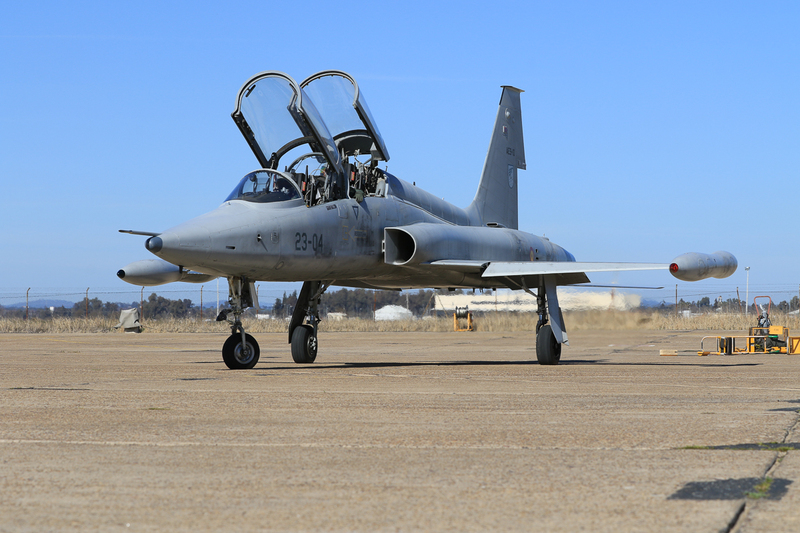 Nowadays Ala 23 has in line 19 aircraft and in almost fifty years of flying the Northrop/CASA fleet has exceeded 125,000 flight hours. 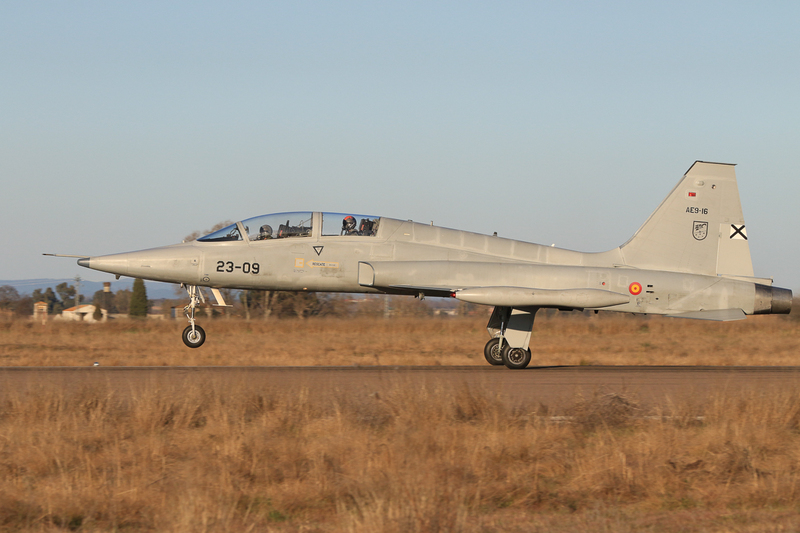 The SF-5Bs, which in 1978 have been reserialed in AE-9 (Ataque/Enseñanza, Attack/Training), have undergone two different midlife update programs; the first one, performed in collaboration with Bristol Aerospace, started in 1991 and extended the life of the 23 SF-5Bs airframes to 3,000 hours. 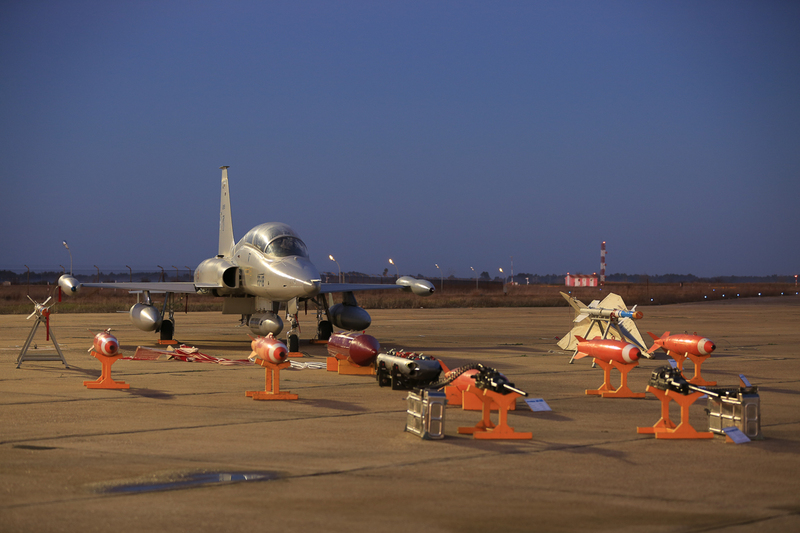 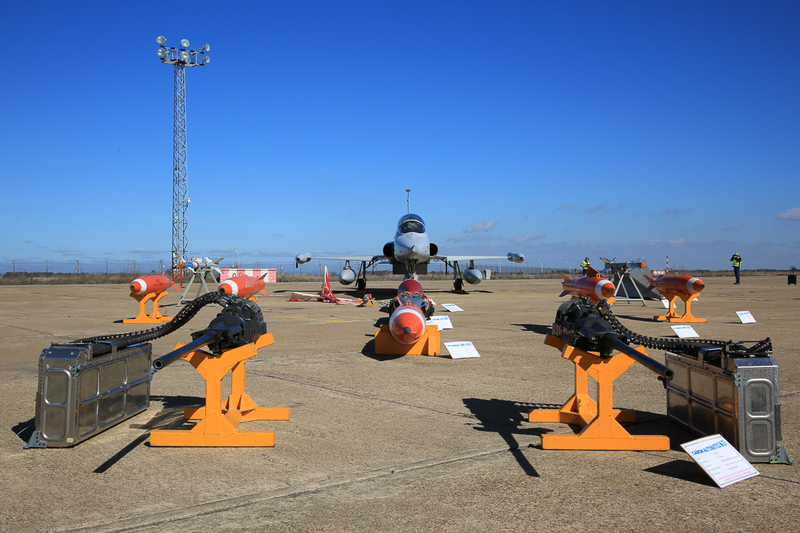 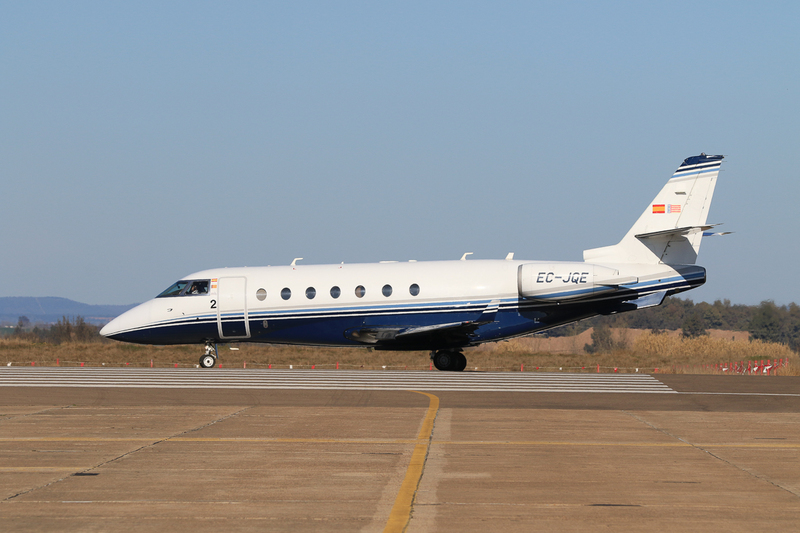 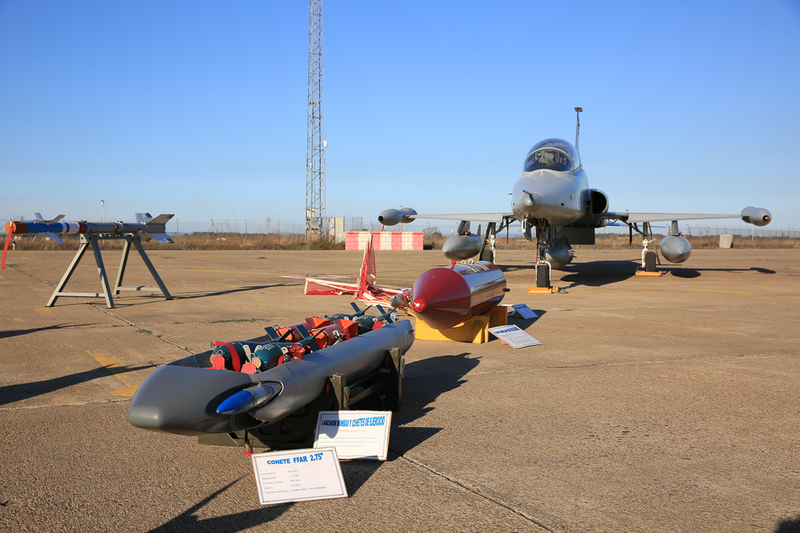 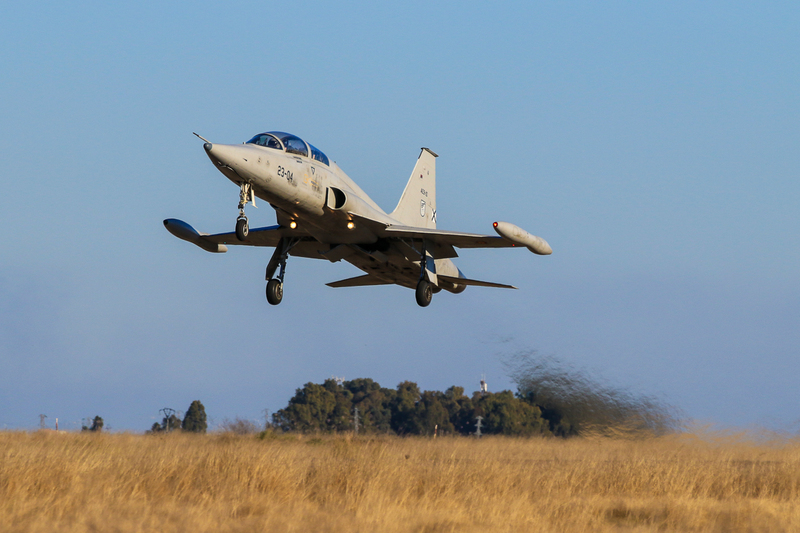 The second upgrade plan, assigned in 2000 to IAI (Israel Aircraft Industries) and then subcontracted to EADS/CASA, brought the remaining 19 aircraft to the SF-5M standard. 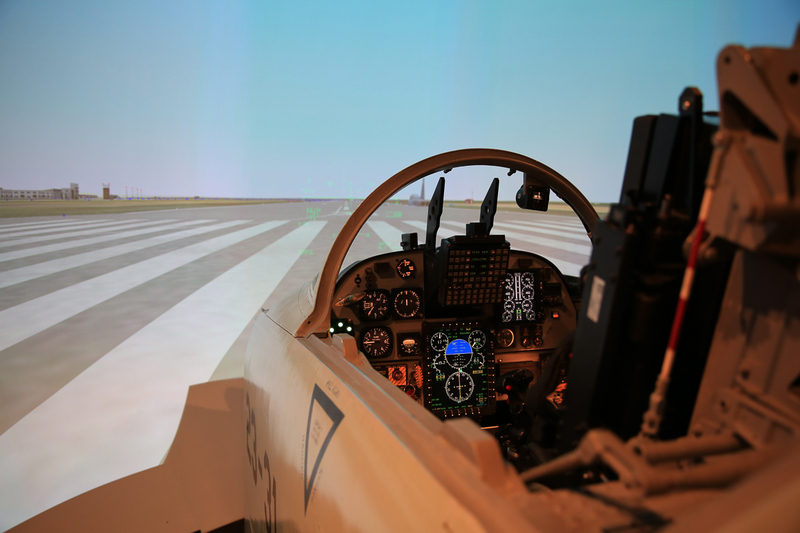 The main focus of the update was on avionics; the installation of a glass cockpit with Multi Function Display, an Head-Up Display, HOTAS (Hands on Throttle and Stick System), virtual radar and new navigation (with GPS and INS) and communication systems, has transformed the SF-5M in a lead-in fighter trainer perfectly tailored to prepare the pilots to their final assignment. 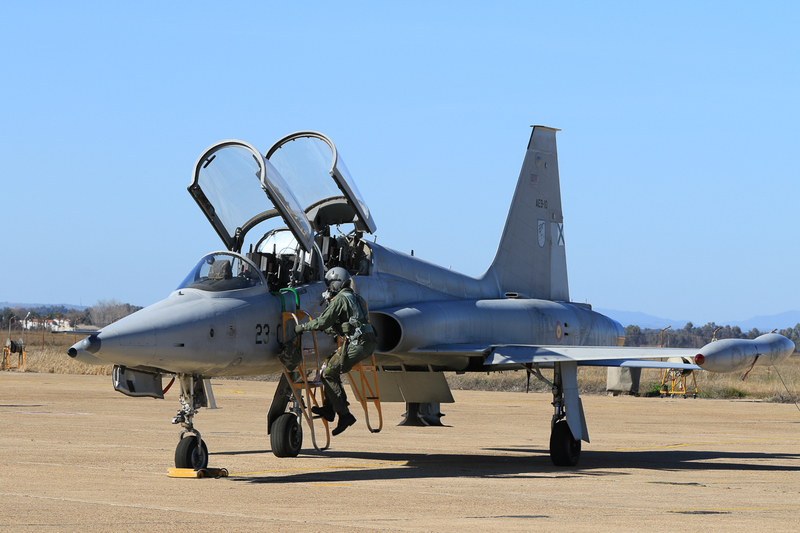 Moreover the wingtips have been modified in order to accept the AIM-9J Sidewinder, while the new Martin Baker Mk-16L (a zero-zero ejection seat, the same installed on the Typhoon) has canceled the need for the pilots to strap themselves on their parachute before entering the cockpit. 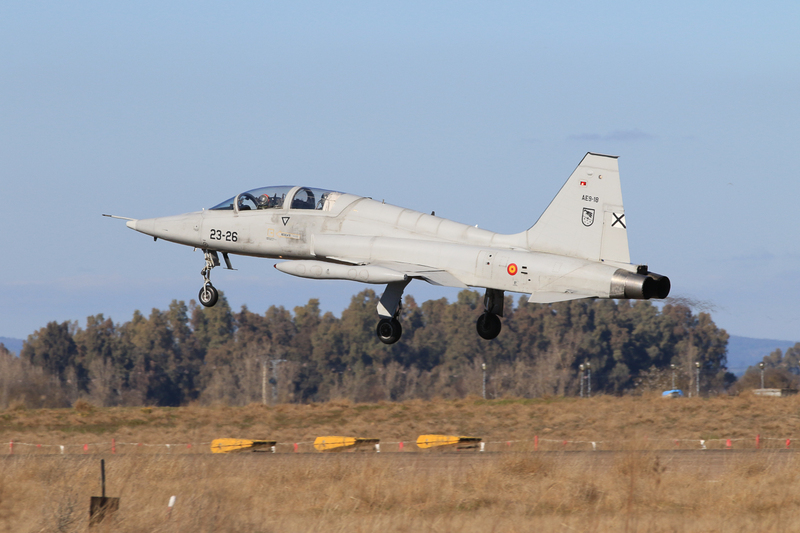 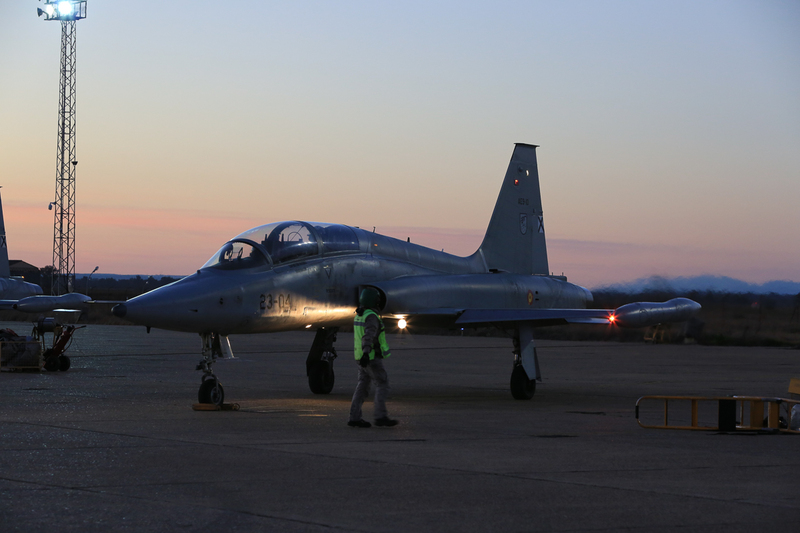 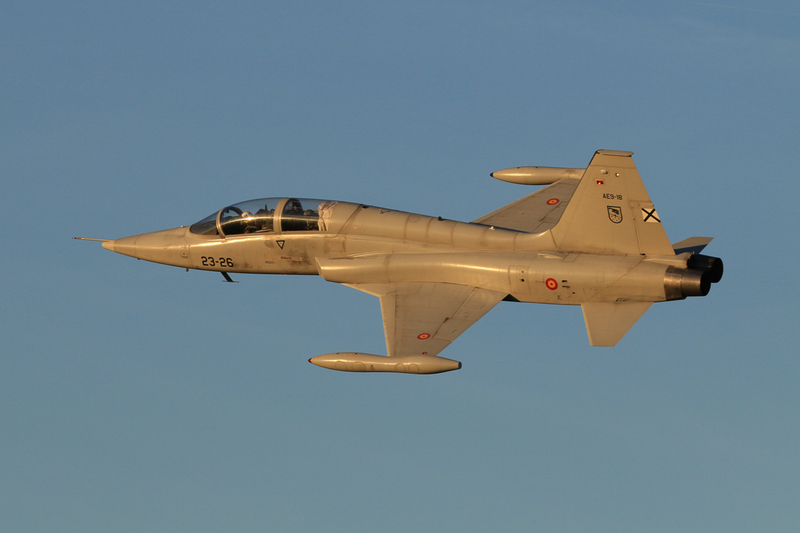 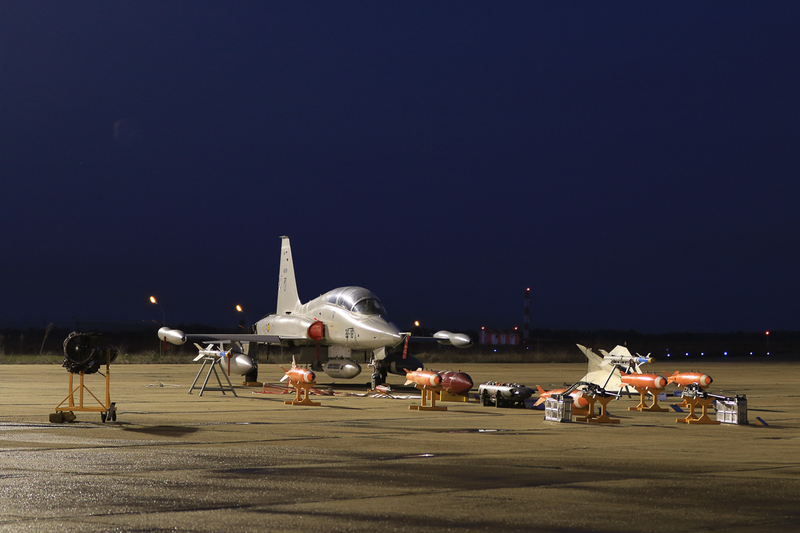 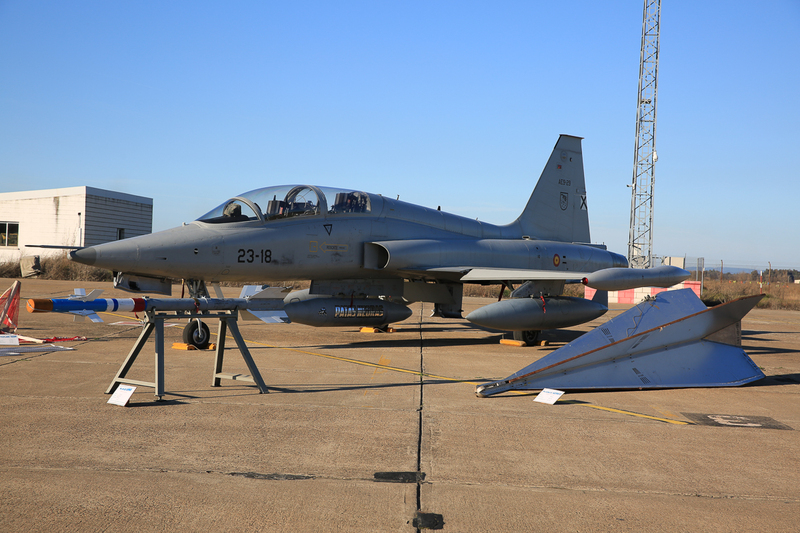 The process of selection of the trainer which will replace this flying icon is still in the early stages, but there is plenty of time because the update program has extended the life of the airframe until 2027. 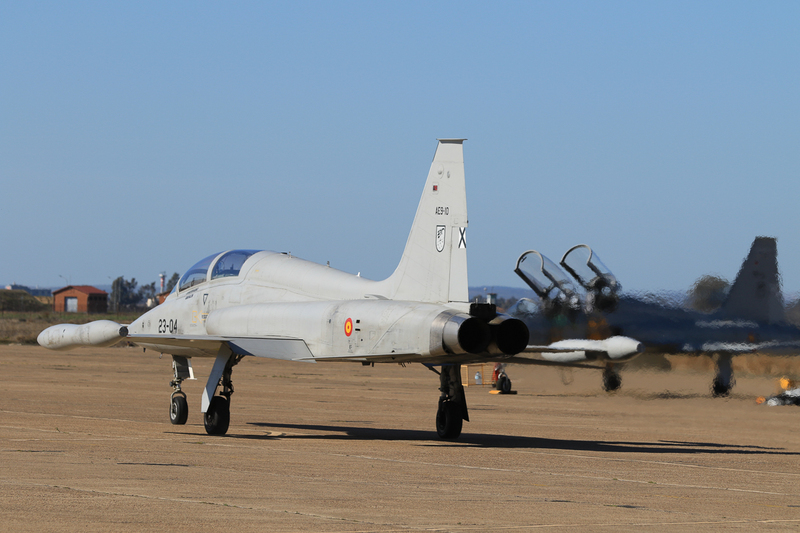 Well before the arrival of the new trainer, whatever she will be, a new aircraft is about to taxi on Talavera’s runway; four General Atomics MQ-9 Reapers are planned to be delivered to Ala 23, ready to be operational in 2020. 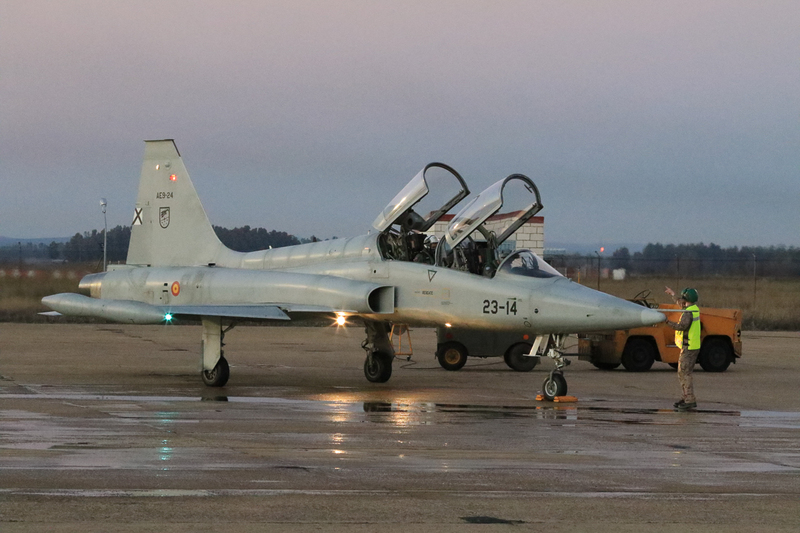 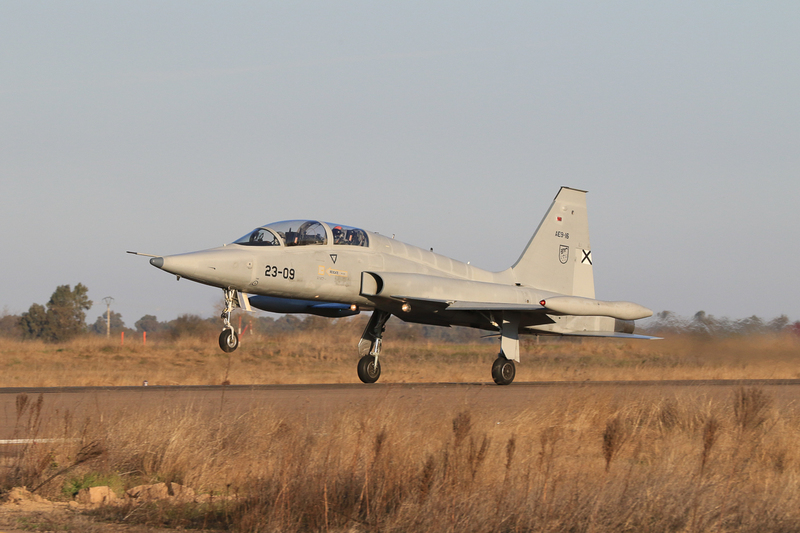 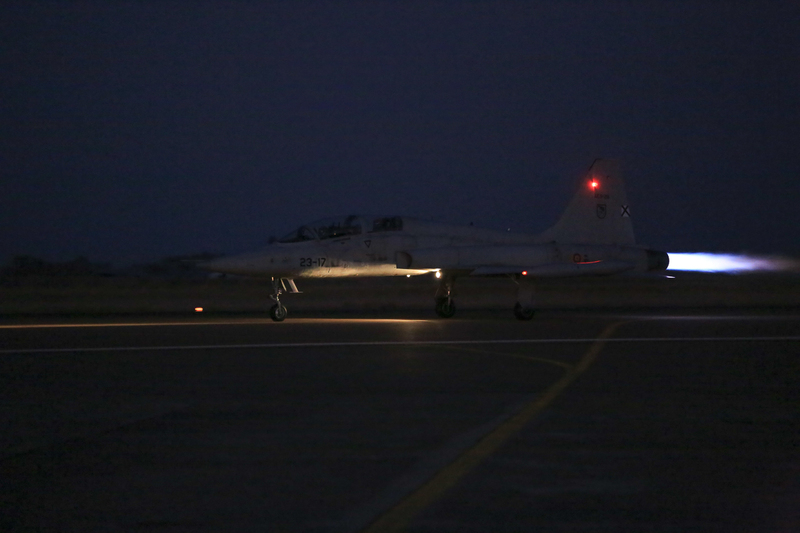 Having received dozens of requests to visit the base to photograph an airplane which is almost unique in Europe (the only other air force operating F-5s is the Swiss one, and their retirement is approaching), the Ala 23’s command has decided to host a two-days event in order to satisfy all those requests with a well-coordinated effort. 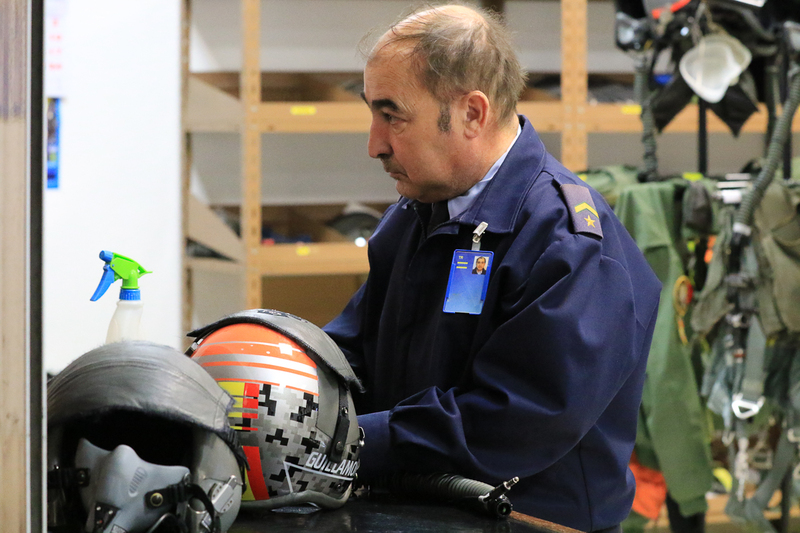 Greeted by Colonel Vidal, Wing Commander, and Colonel Marazuela, chief of the flight operations, we have been briefed to the history of Ala 23 and to the safety rules to obey during our stay in the base. 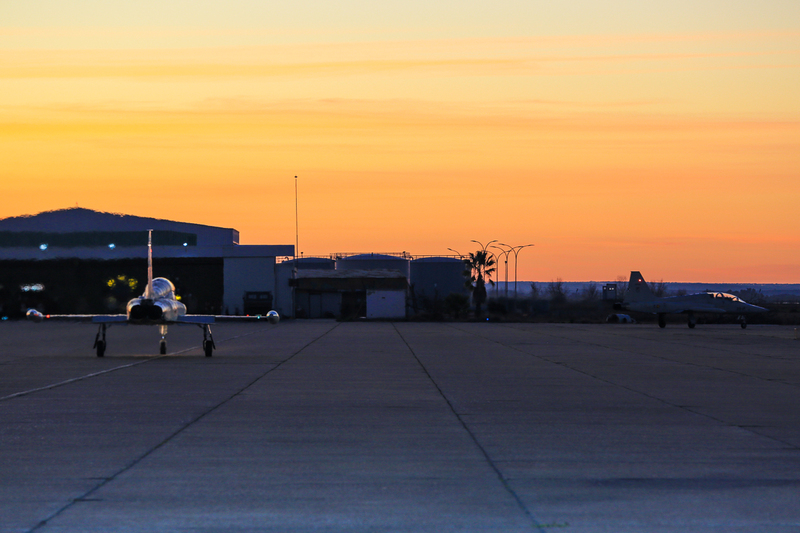 The schedule for the two days has been really satisfying; each day we have had the chance to take pictures of the pre-flight operations of seven aircraft parked on the apron, which have been readied for three daily 4-ship waves, the last one of both days launched on sunset. 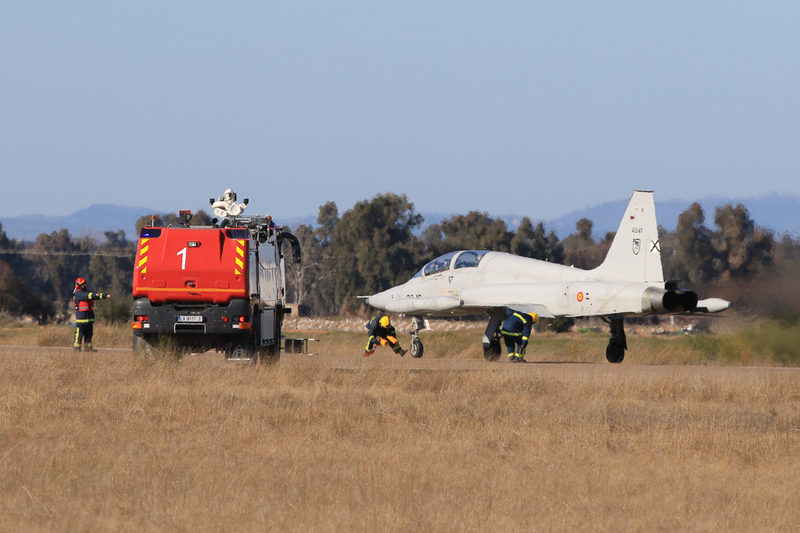 In order to exploit at the best their take-offs and landings we have been always brought in vantage points, obviously due regard being paid to the safety rules. 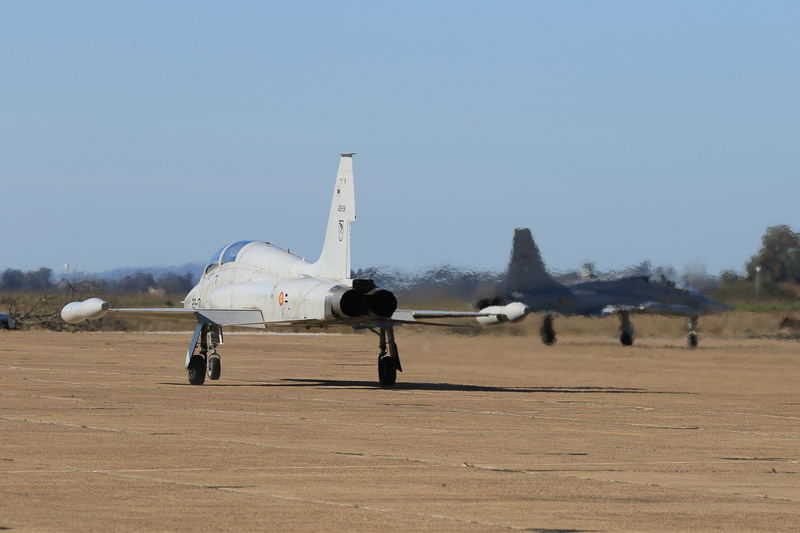 In addition, two SF-5Ms were on static, exhibited with all the loads the airplane can bring in the training missions. 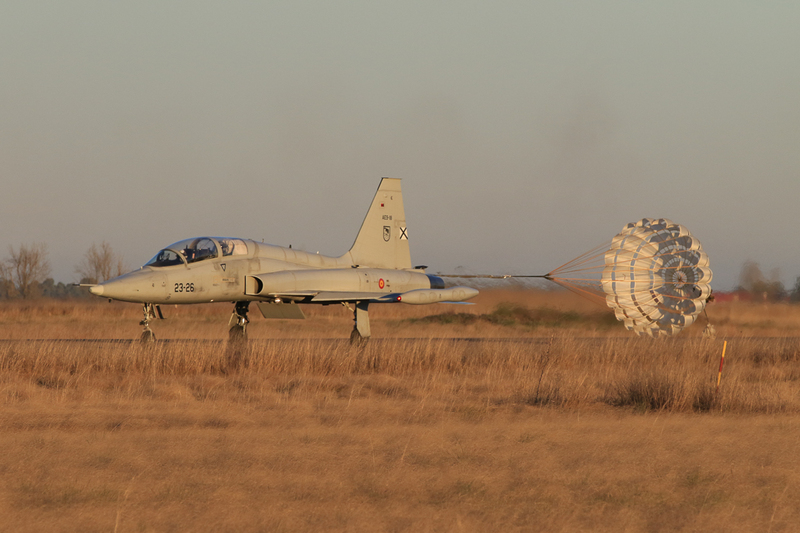 It’s not easy to think of a better treatment to receive! 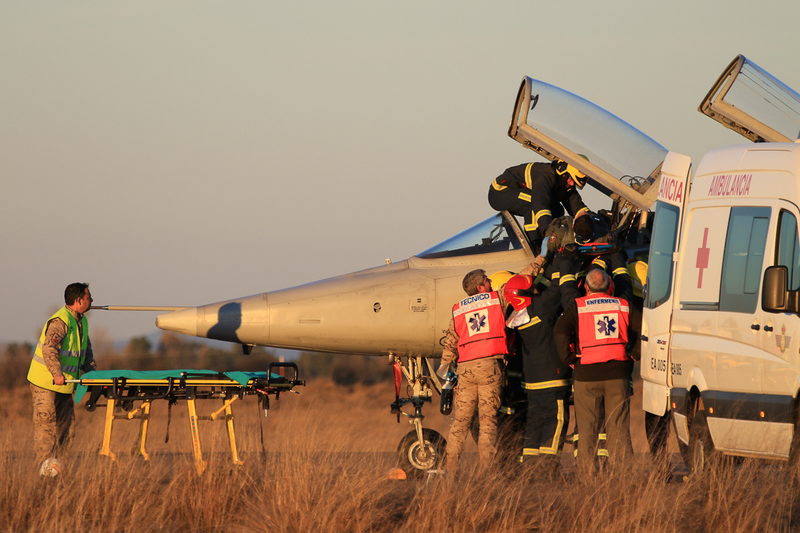 And if that wasn’t enough, we had a front-row ticket to a rehearsal not common to assist to; the simulation of how to extract a pilot from an aircraft that has impacted a bird while landing. 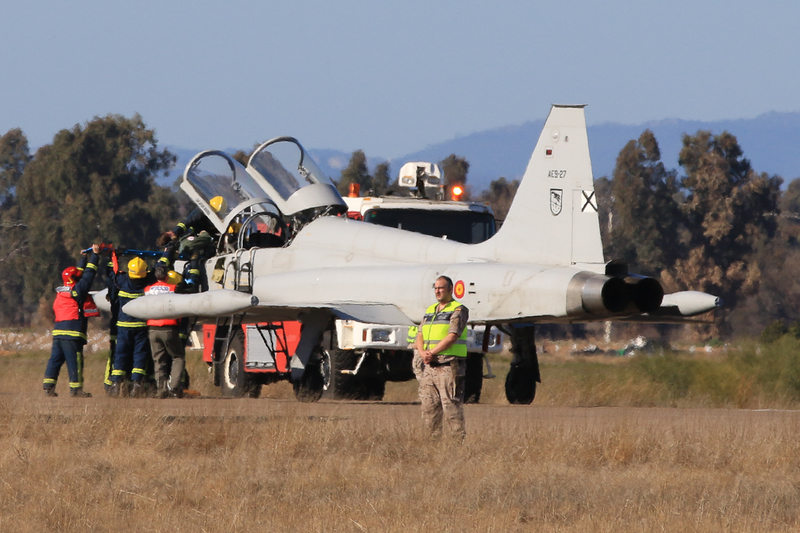 The rescue operation has obviously involved the active participation of firemen and medical personnel, and it has been a really interesting experience understanding how an unconscious pilot can be extracted, dead weight, from the cockpit. 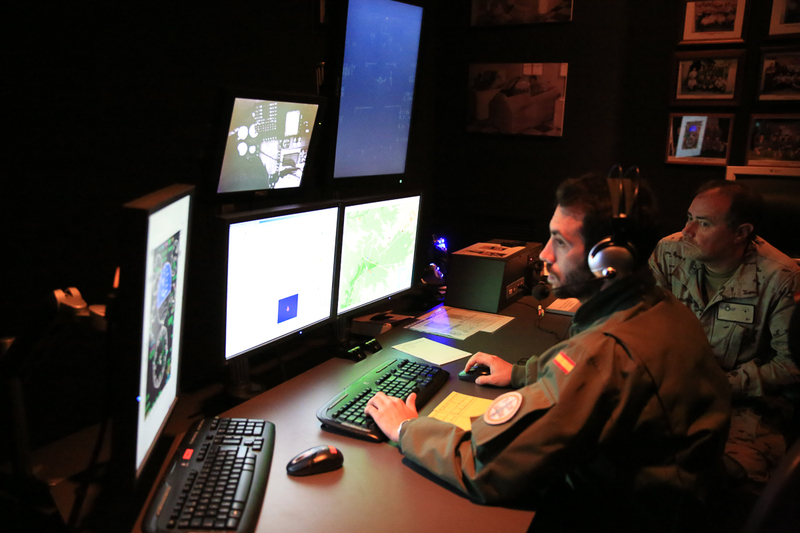 We had also the opportunity to pay a visit to the simulator room, where a student pilot was flying a night mission. 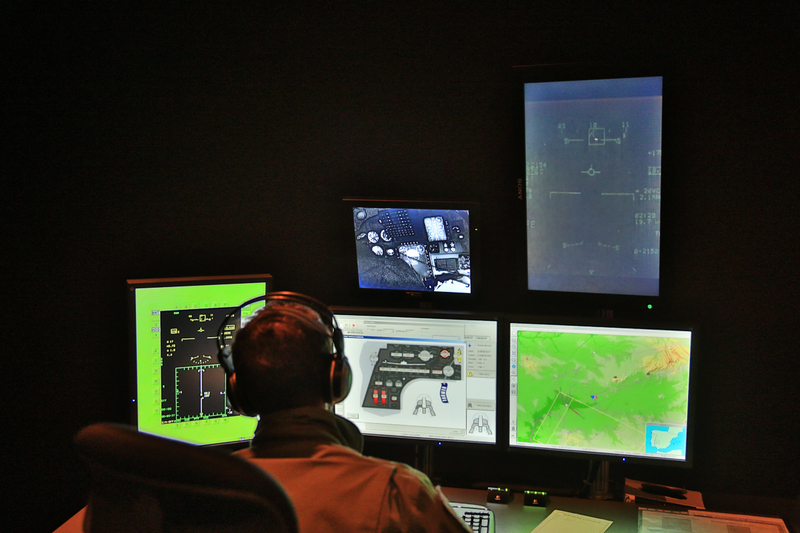 The simulator, developed by the Spanish company INDRA, comprises about 20% of the flight hours flown by the students. 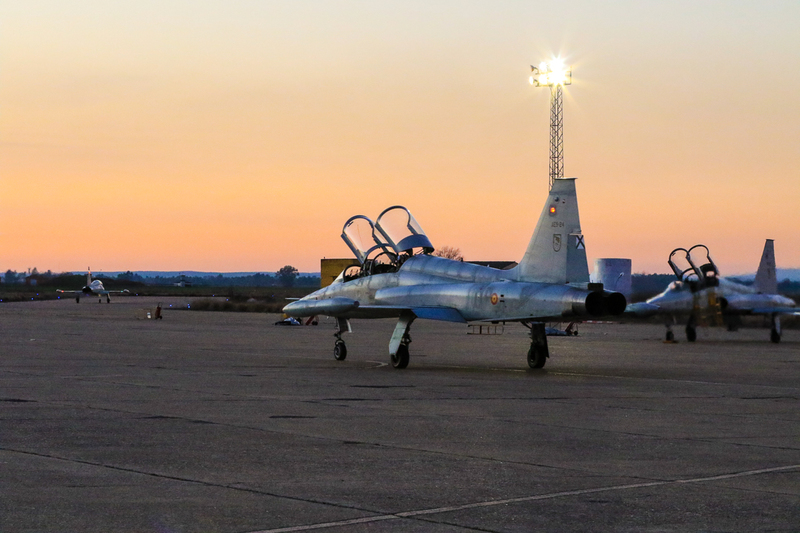 After two intense days spent in Talavera base, whose internal roads are lined with wonderful bitter orange trees, we can say to have fully enjoyed Spanish hospitality. 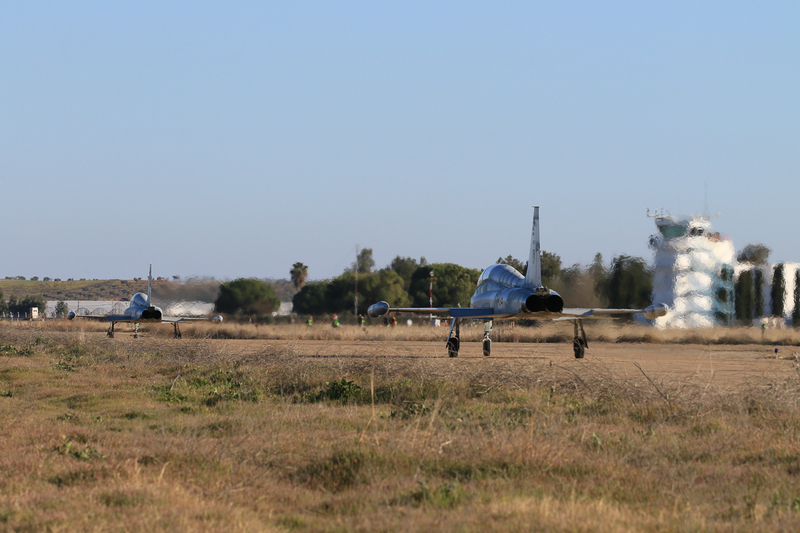 Kudos to Ala 23’s command and to all the airmen and personnel involved for having devised and managed such a well-organized event dedicated to the aviation enthusiasts; this event has ultimately set the standard for how a Spotter Day should be! 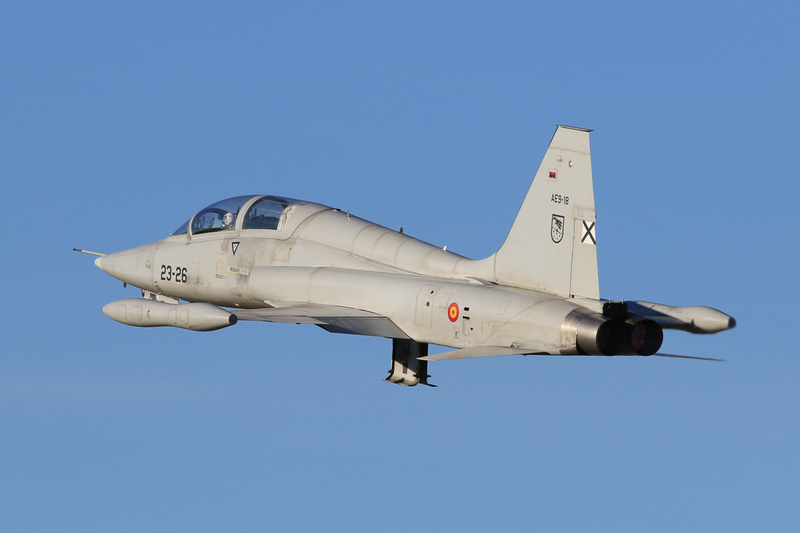 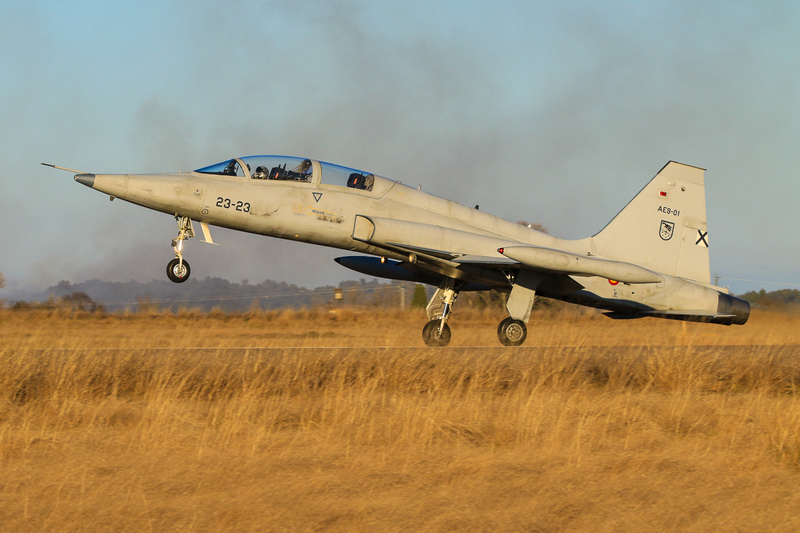 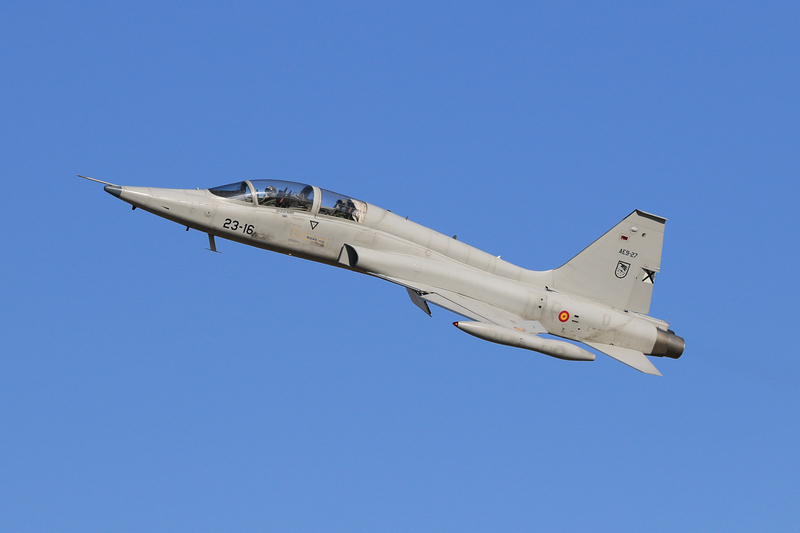 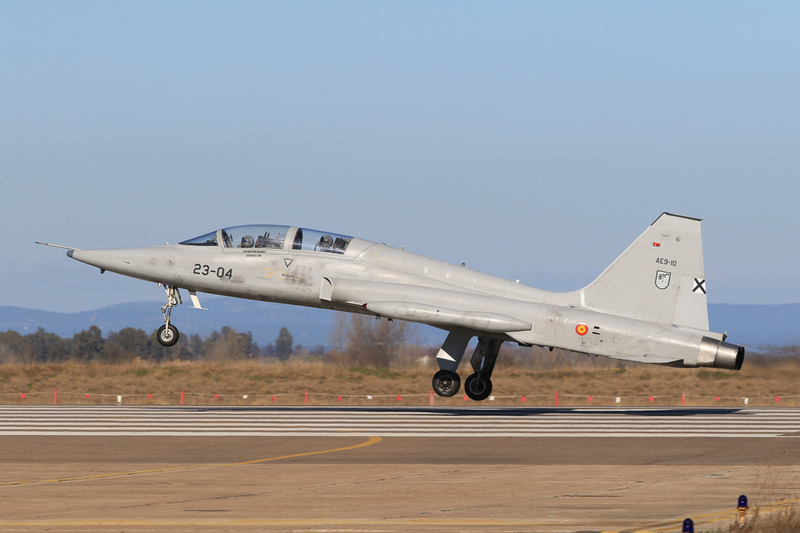 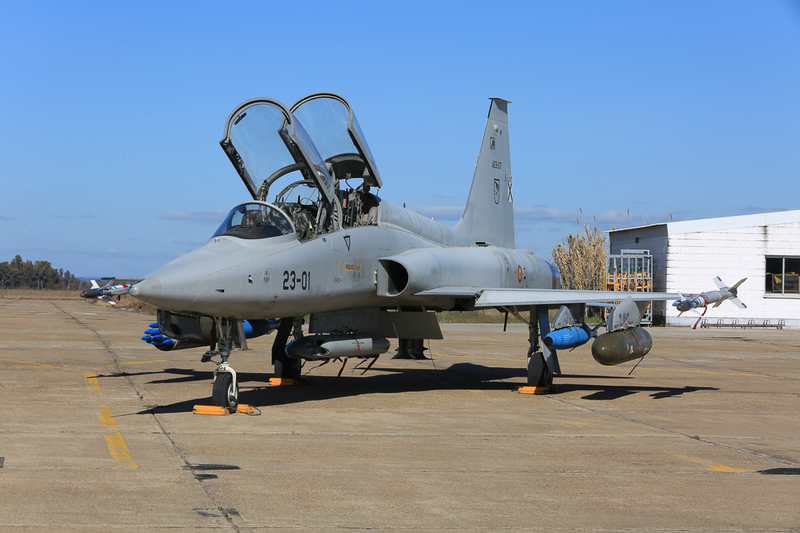 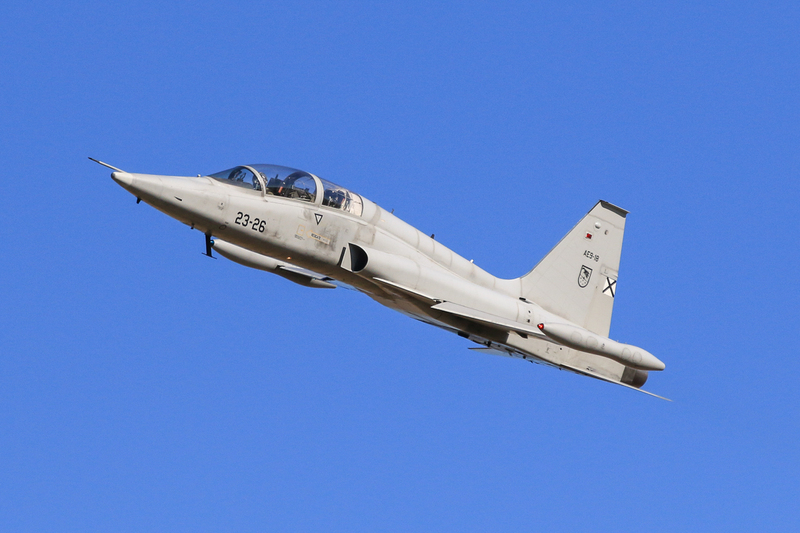 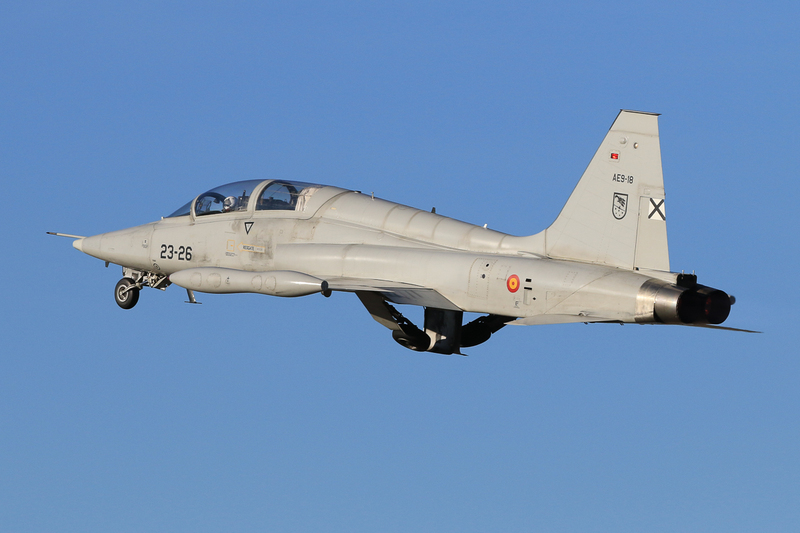 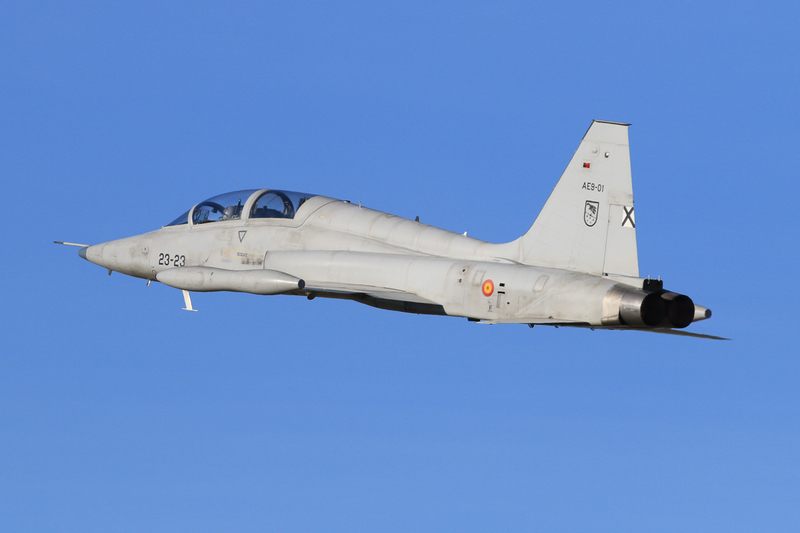 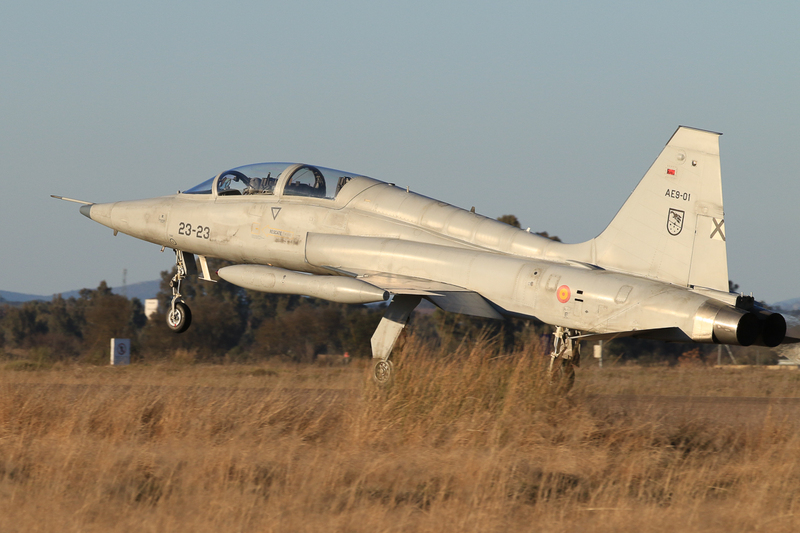 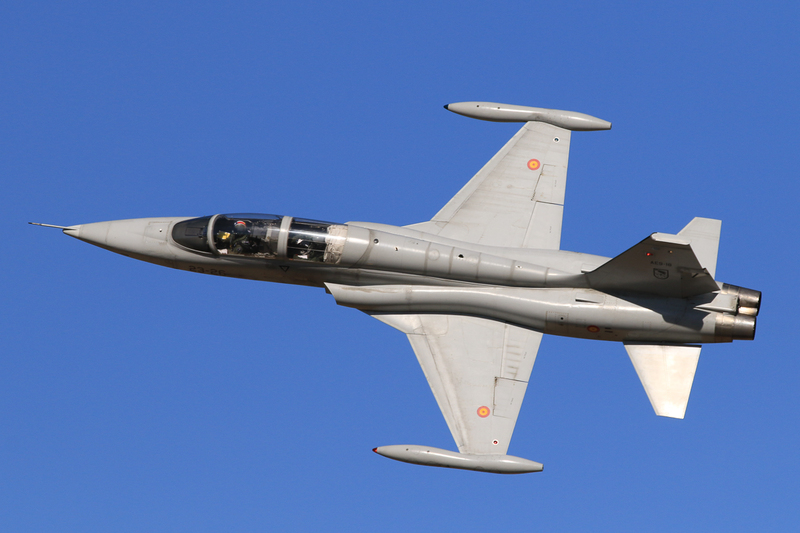 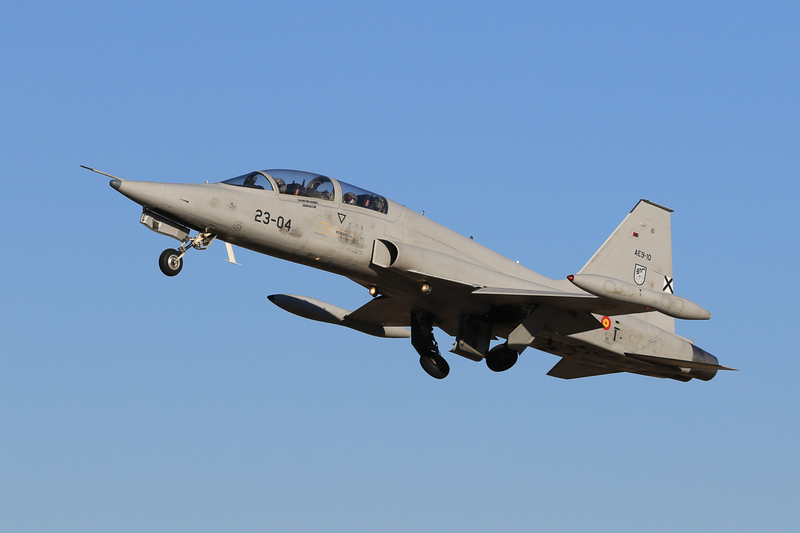 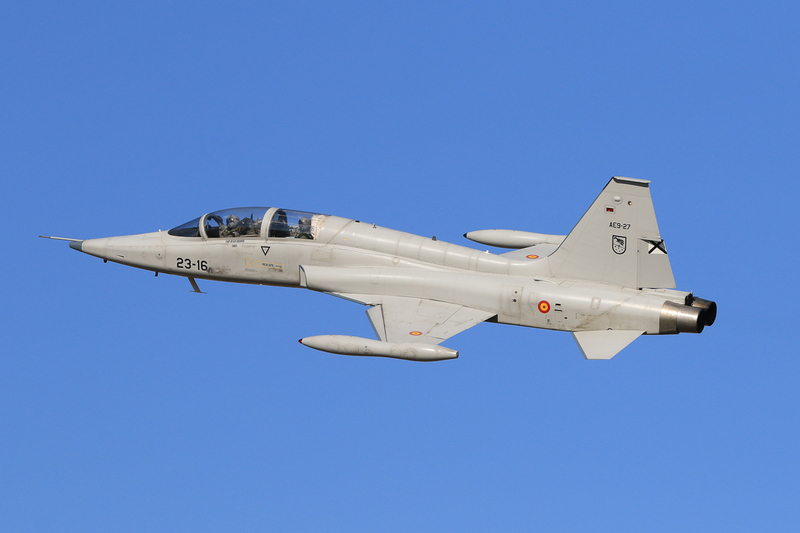 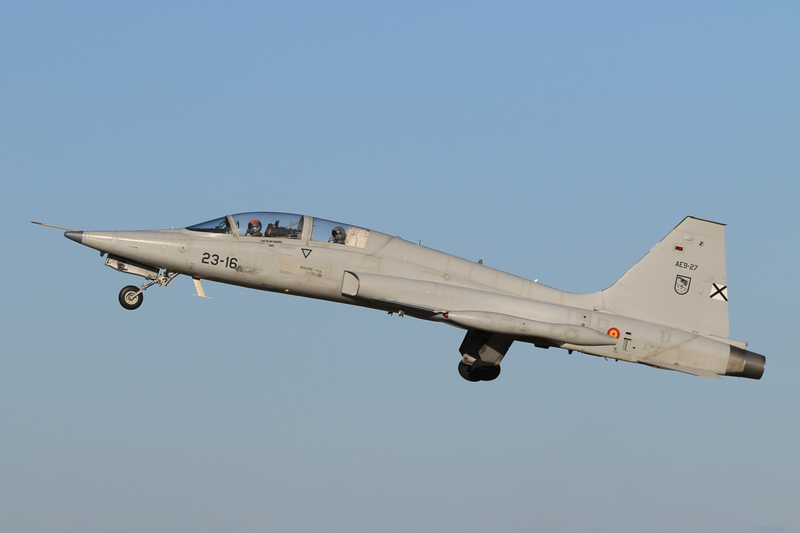 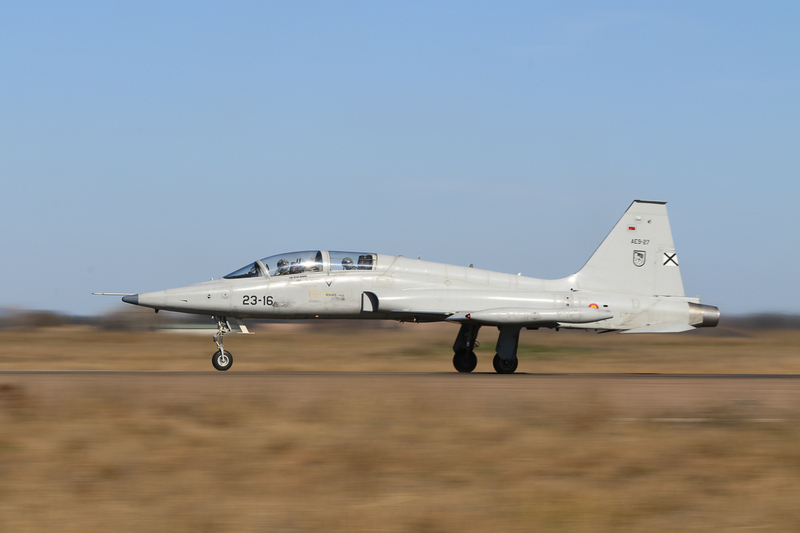 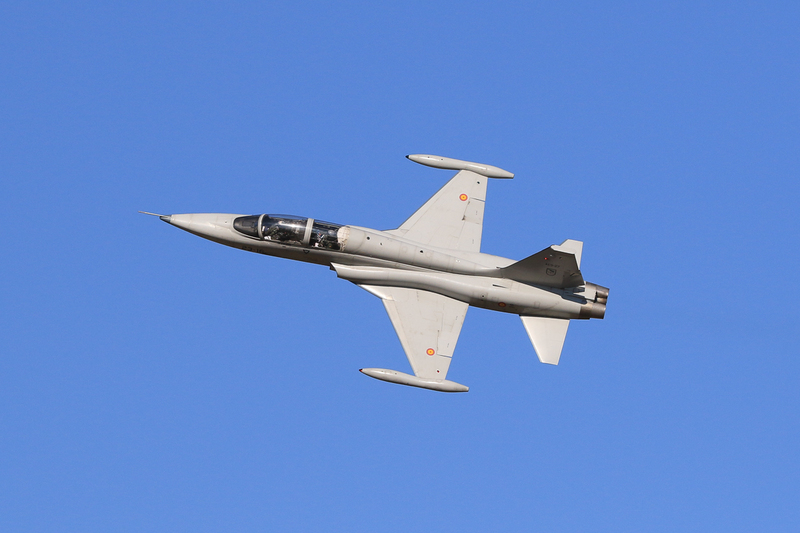 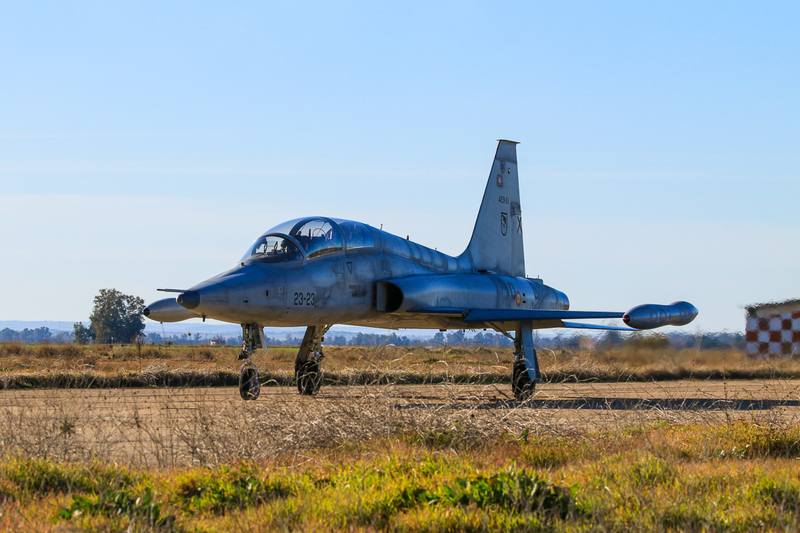 In 2020 Ala 23 is planning to host an air show to celebrate 50 years of SF-5M’s operations; it’s a milestone that not every aircraft model has reached, so we’ll surely be back in Extremadura to join the celebrations! 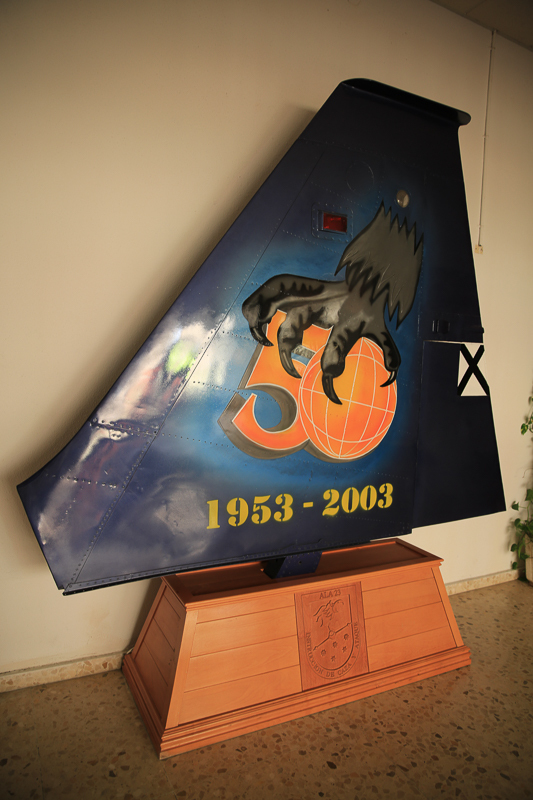 Gabriele was born in Turin, Italy, grew up in Sicily and now lives in Rome. 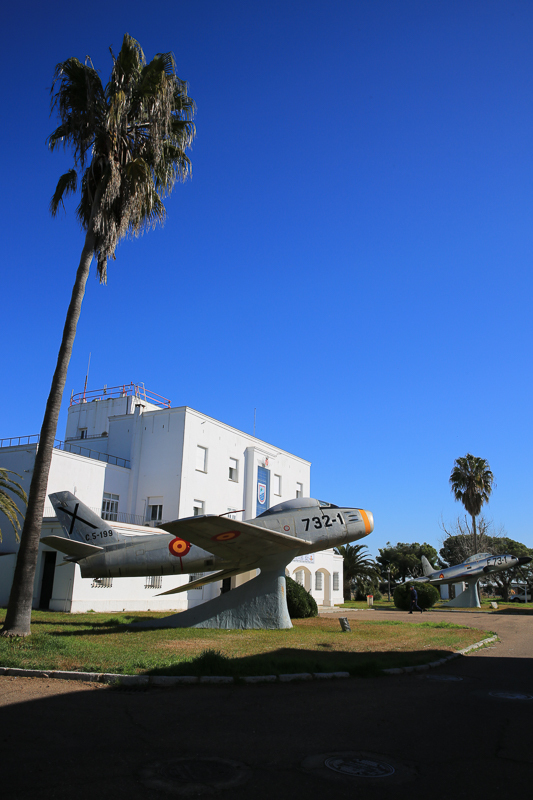 His love for aviation goes back to the days when he was seven years old, he started to collect the ‘History of Aviation’ sold weekly at the nearby newsstand. 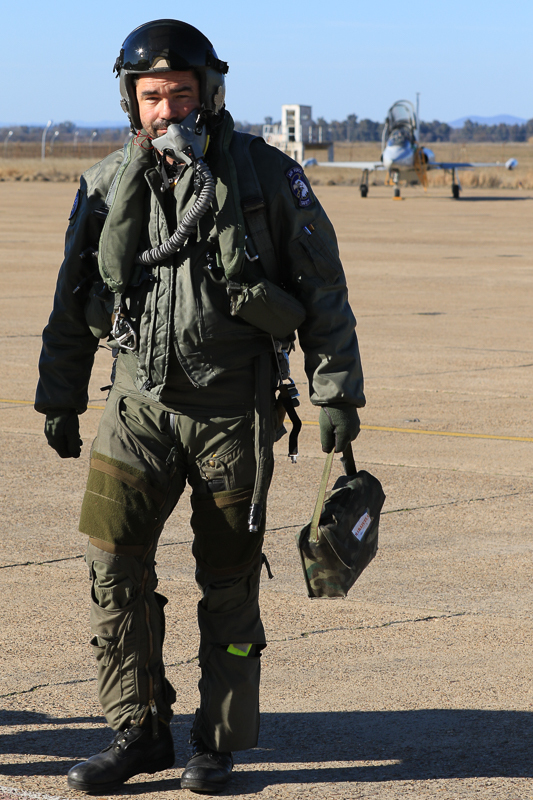 With that, he realized that his goal was to become a military pilot. 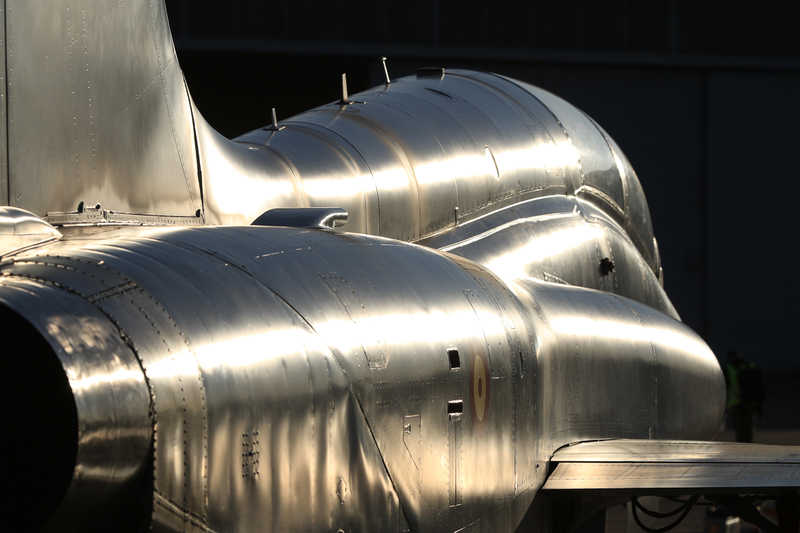 This dream met a harsh reality when, during the medical tests, a defect in his chromatic sense of sight was discovered. 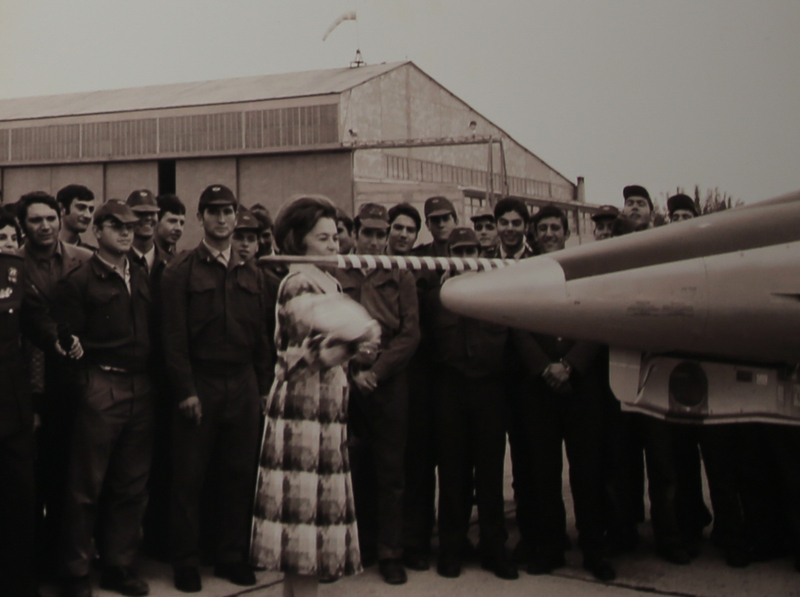 His interest in photography arose a few years later, when he bought from a colleague his first single-lens reflex camera, a Pentax ME Super. 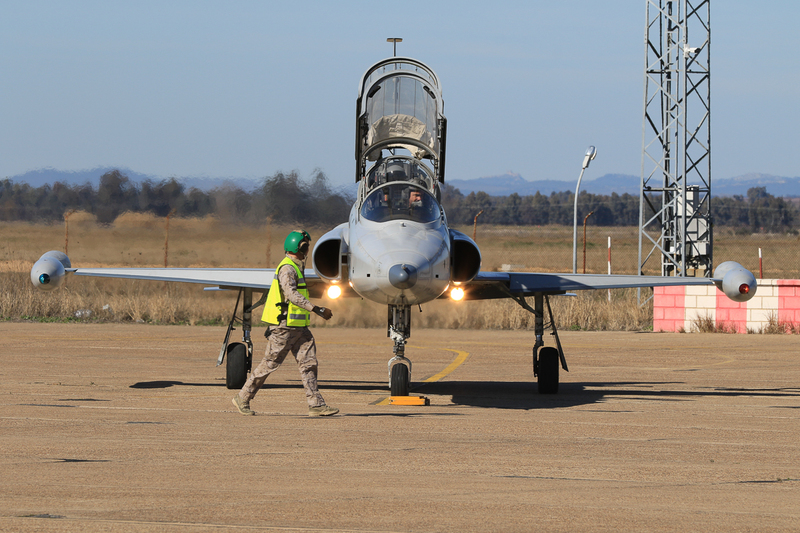 Then everyday life took its toll; working as an IT analyst, studying for an MD in political science and starting a family left no time for enjoying his old interest for aviation. 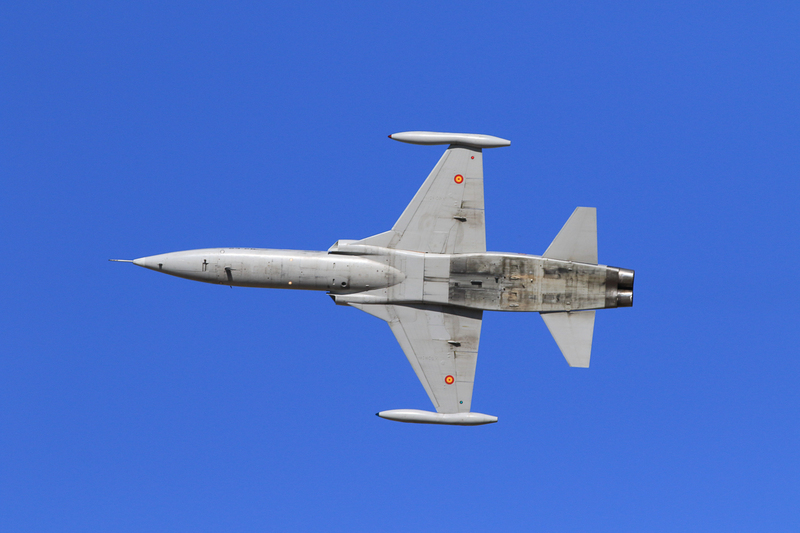 One day in 2008, he decided to revive the passion, starting again to take pictures of aircraft each time he has a chance. 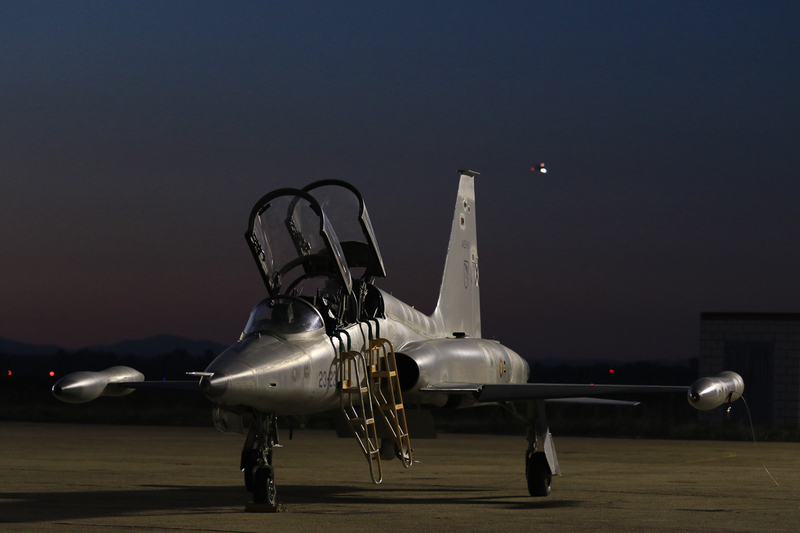 Now, using Canon gear, he is striving to become a photojournalist.